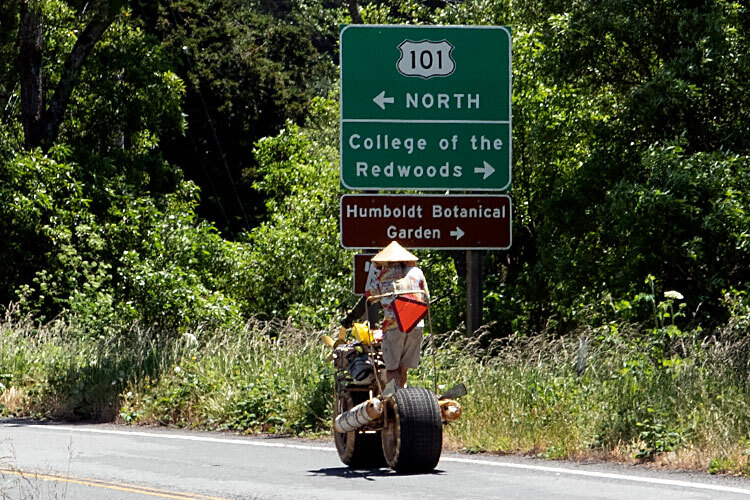 In 1969 Jack Mays challenged Hobart Brown to a sculpture race in Ferndale, California. 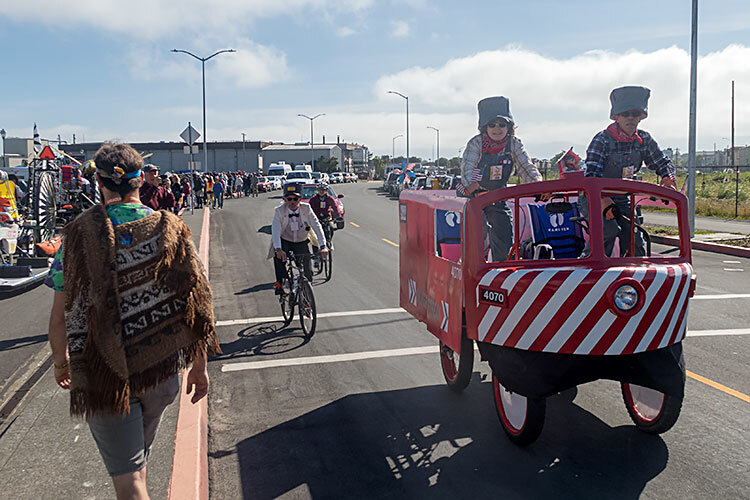 Fifty years later—in 2018—that race had grown into a 3-day, 50-mile extravaganza over pavement, sand, dirt, and water, with the finish line still in Ferndale (a 261-mile drive north from San Francisco). 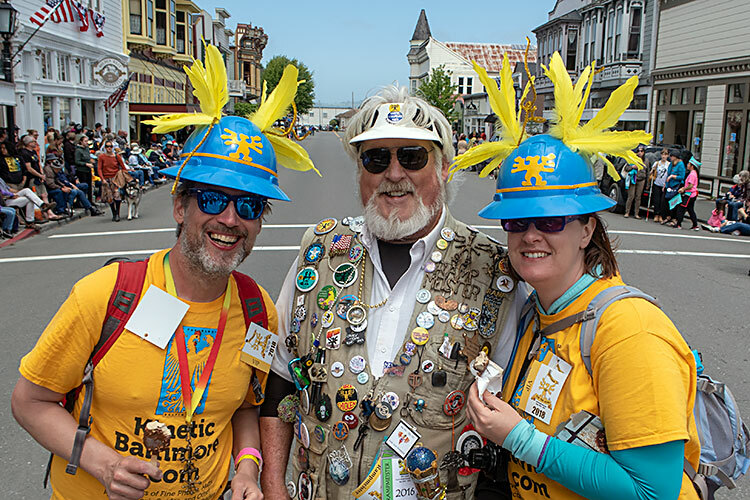 Fifty-nine teams registered for the 50th Solid Gold Kinetic Grand Championship May 26–28. 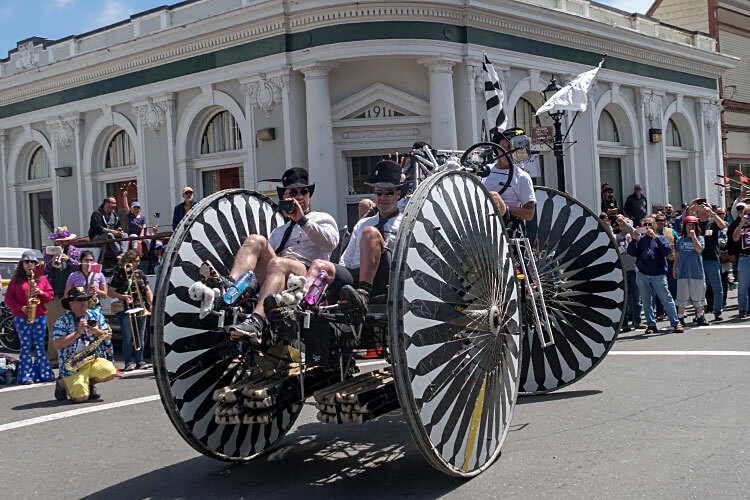 Dawn Thomas created a massive Kinetic Kompendium documenting the history of the race, including hundreds of photos. 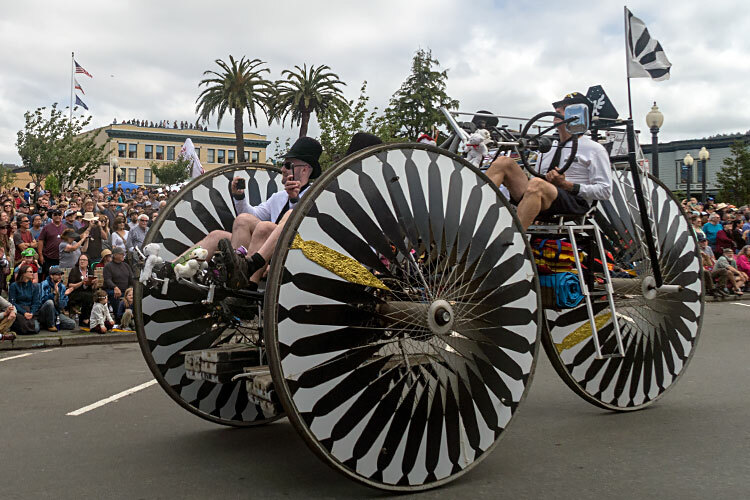 Special guests came from other kinetic races in California, Oregon, Colorado, Massachusetts, and Maryland. Johanna and Tom Jones from KineticBaltimore.com made the trek behind the redwood curtain to photograph the race from start to finish. The best 165 of 1,351 photos are in this report. 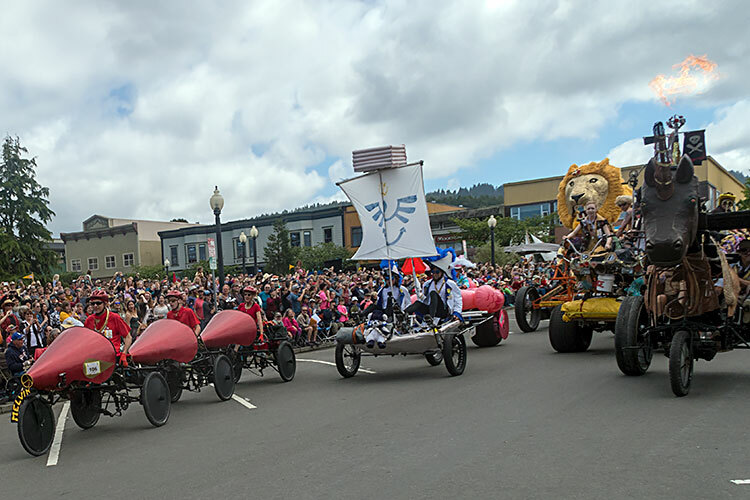 If you’d like to see a golden championship kinetic race, it’s not too late—next year’s 51st race is also the 50th anniversary of the first race, so you should head to Humboldt County in May 2019 for more gold pageantry. 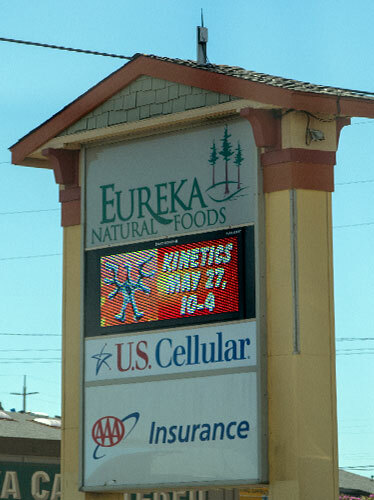 And if you want, there’s more kinetic history here. 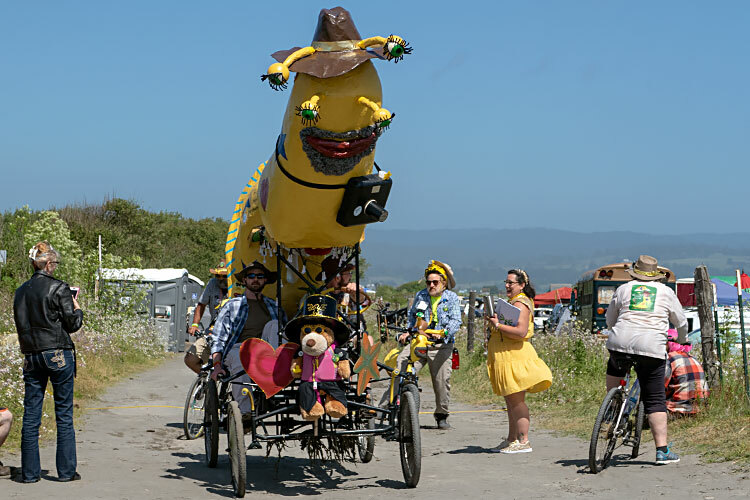 We’d like to thank Elliot Naess for lending us two bicycles to navigate the racecourse, and Goddess Jen-O for helping coordinate our visit. We last saw Sparkle the Horse in our 2004 Pilgrimage, and she retired soon thereafter. 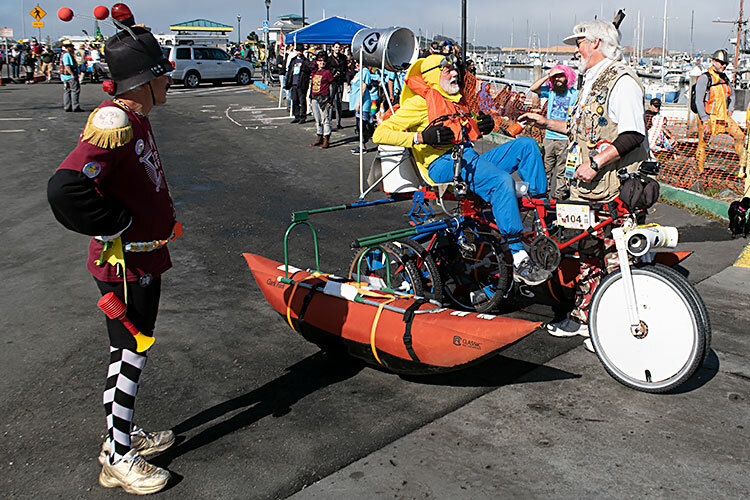 However, Sparkle came out of retirement for the 50th Race, looking as spry as ever. 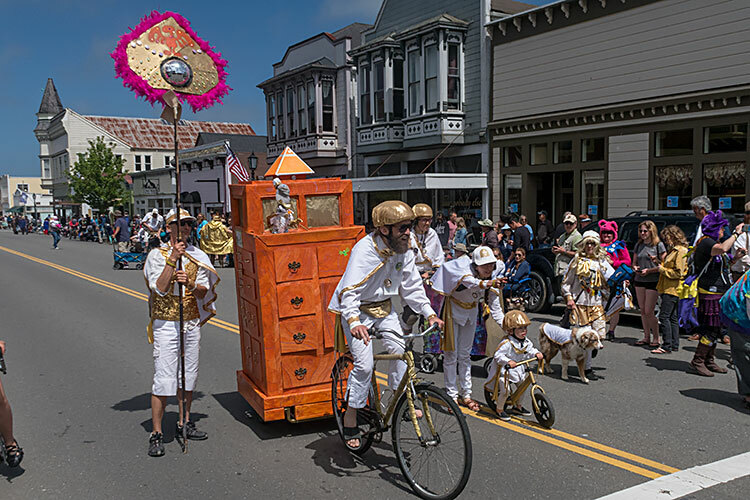 Gilded Ghost Guild aka Kinetic Paranormal Society is a spirit cabinet on wheels, generally towed by a bicycle. 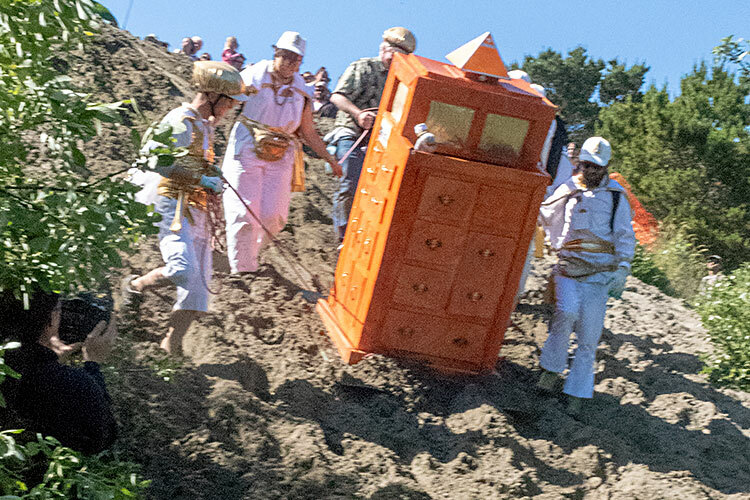 The wardrobe included a puppet (not shown here) providing bizarre commentary through the race. 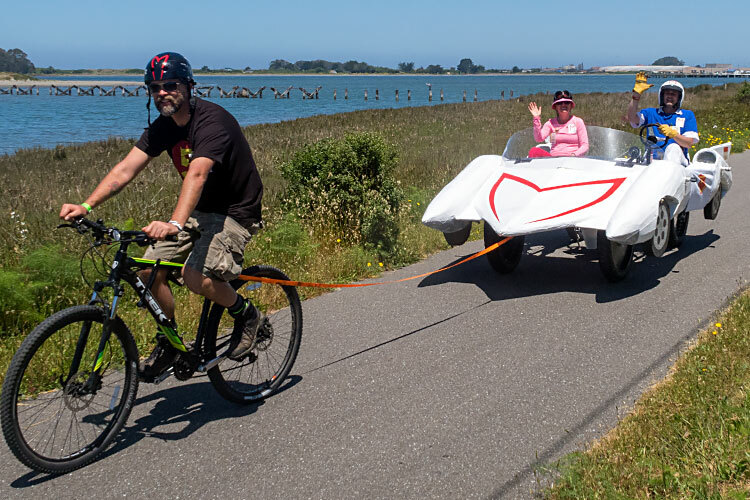 Mite Make It had an unusual 6-wheel design consisting of a quadcycle with 2 trailing bicycle frames with empty front forks. They provided no information to the Spectators’ Guide, so we don’t know anything else. 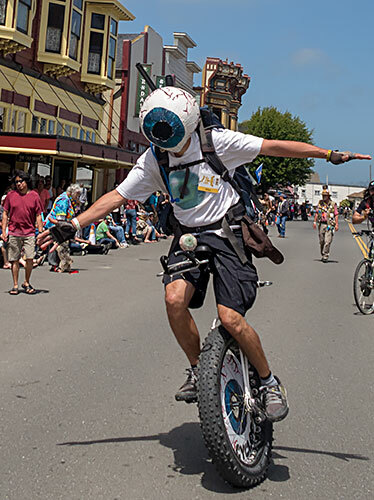 Cyclops was an all-terrain unicycle that took to the water for the first time this year. 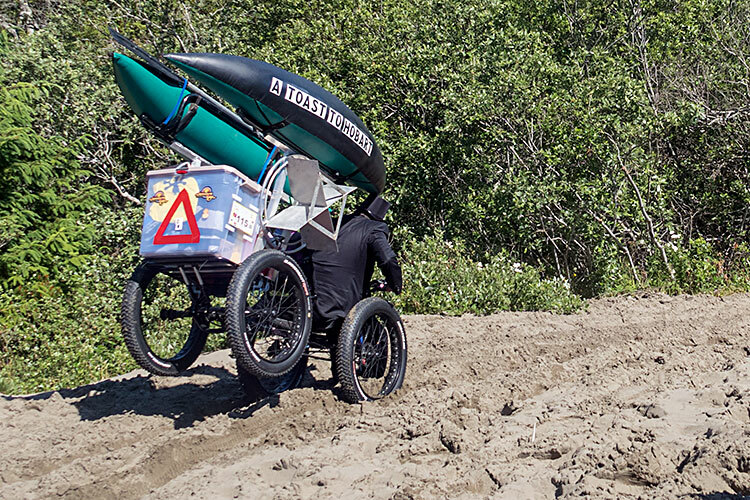 Ferntucky 500 was 2 fat tire bikes in a car-style frame. 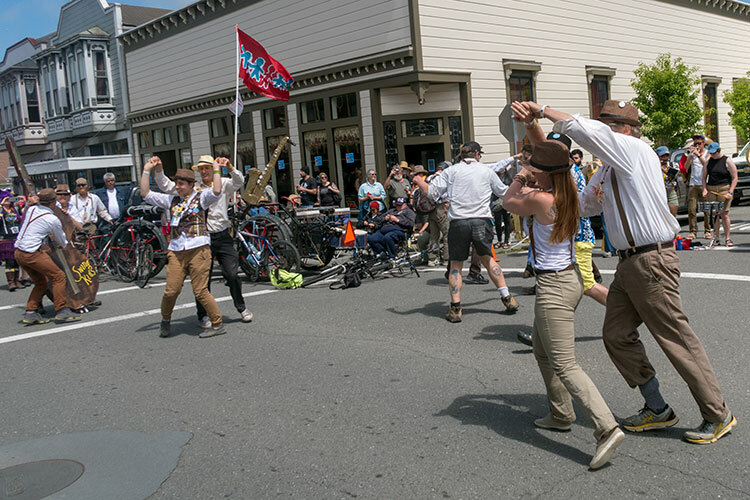 A Toast to Hobart celebrates race founder Hobart Brown. 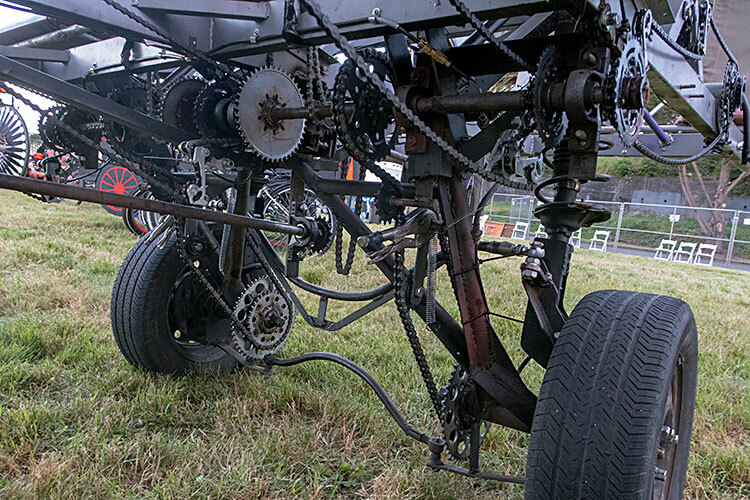 The dual-drive quad had 60 gears, thanks to the combinatorics of 2 internal hubs with 2 and 3 gears combined with a 10-sprocket traditional hub. 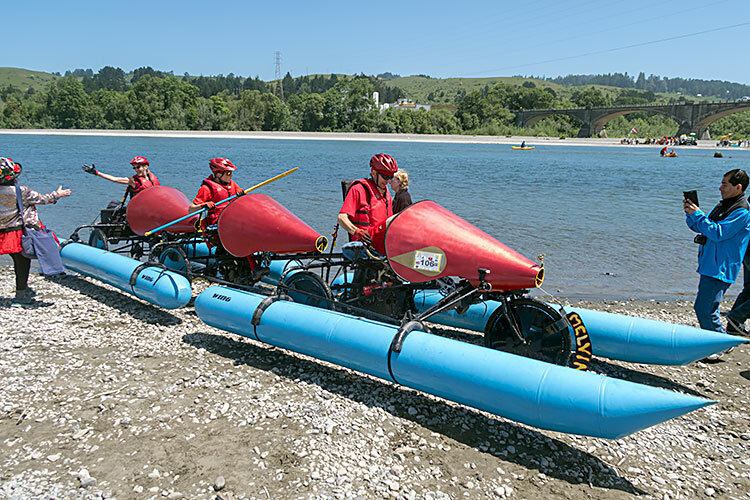 While many Humboldt teams deflate or dismount their flotation on land, these pontoons swivel upward for rapid conversion at water transitions. 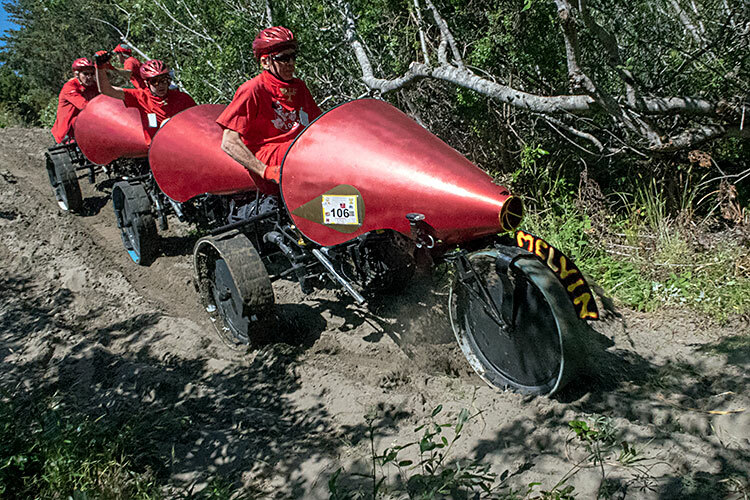 Melvin has raced for 37 years, with their distinctive 3-cone train. 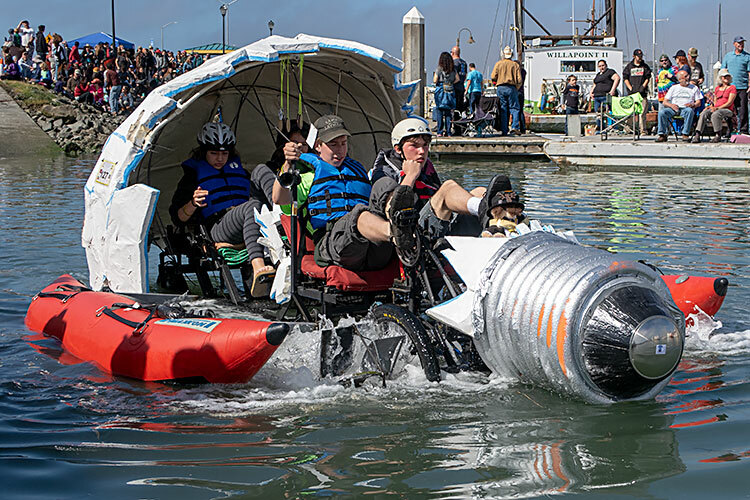 The Notoriously Adventurous Vacationing Yachters has raced for 1 year, but on Monday they won the Goddess Jen-O Award. 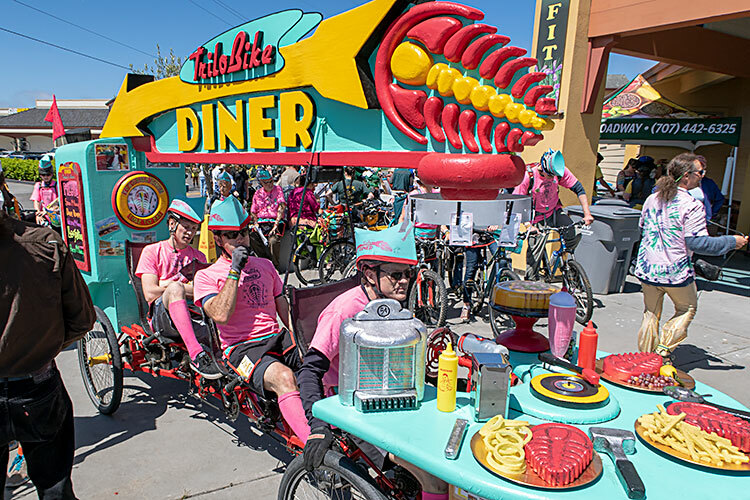 Trilo Bike Diner had a real clock and fake meals, celebrating the historically anachronistic union of trilobites and the classic diner restaurant. Their gear was stored in the refrigerator at the back. 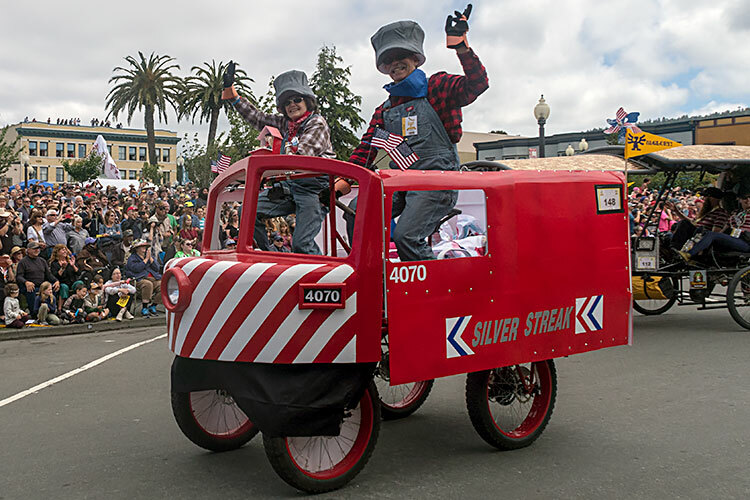 Silver Streak commemorated the highly distinctive red & white locomotive from its namesake 1976 movie. The body was made of foam board and corplast. 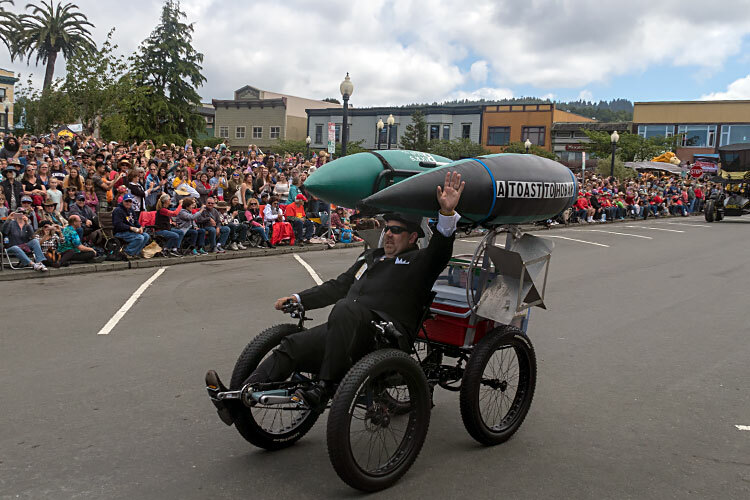 Black Tie Affair is a 20-foot long front-wheel drive tricycle with 82-inch 120-spoke wheels and Honda Civic disc brakes. 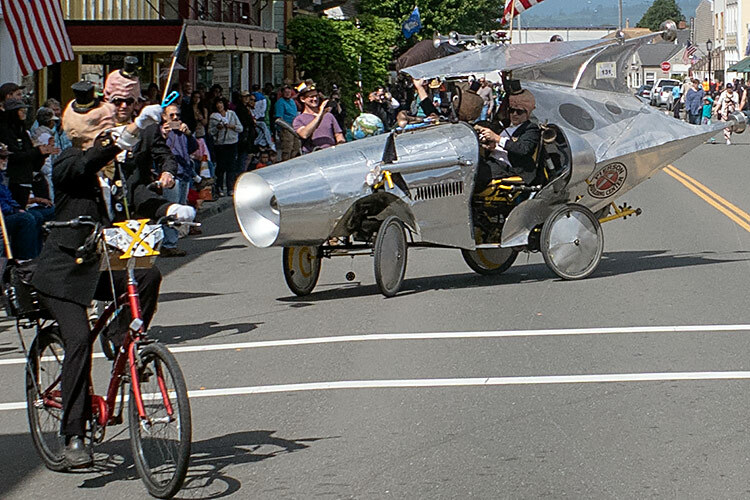 One of the spokes was a golden tie for the 50th race. 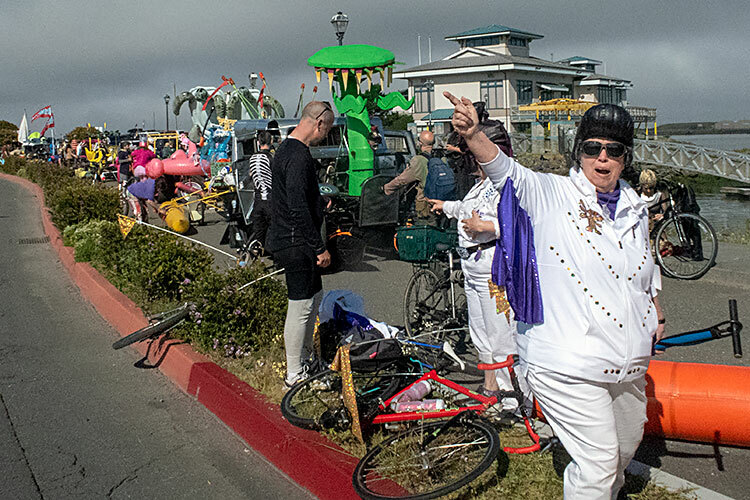 Don’t miss the spectators atop the Hotel Arcata. 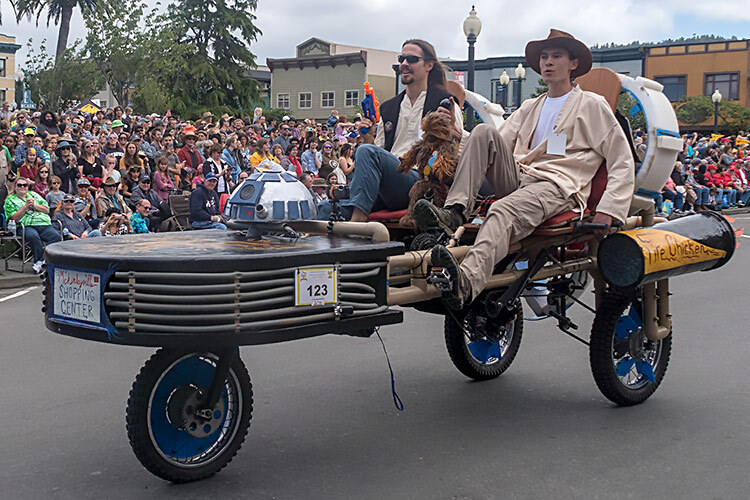 Fire Chicken was a Star Wars Landspeeder, complete with R2-D2. 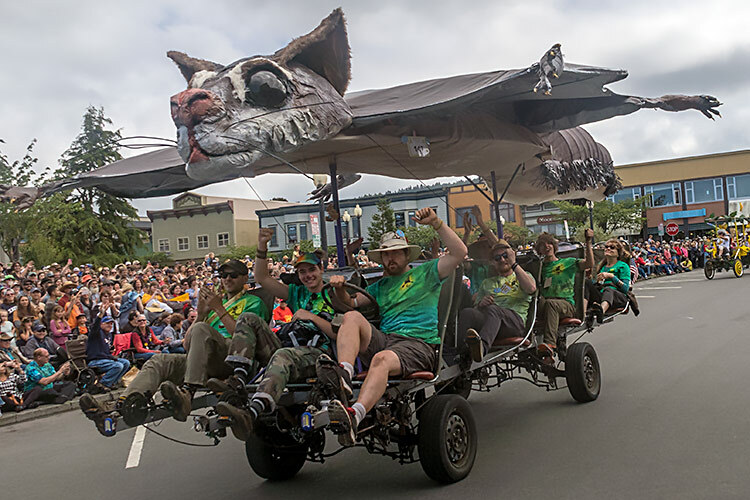 With 12 recumbent pilots, Cloud of Unknowing—Flying Squirrel qualified as mass transit. 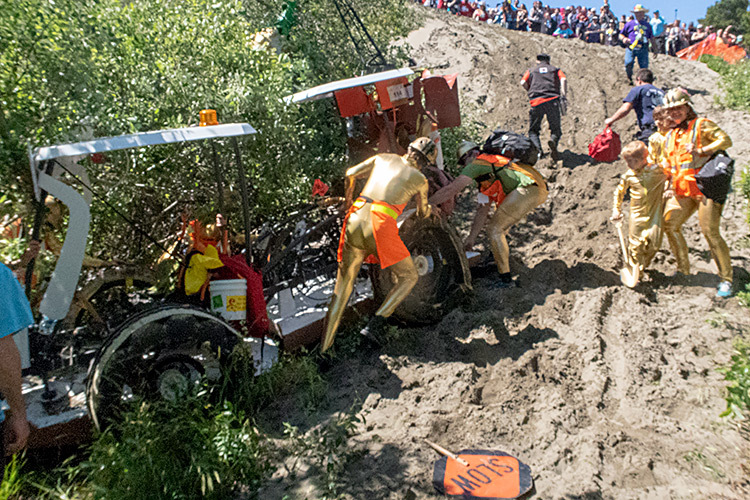 It was this team’s second year racing. 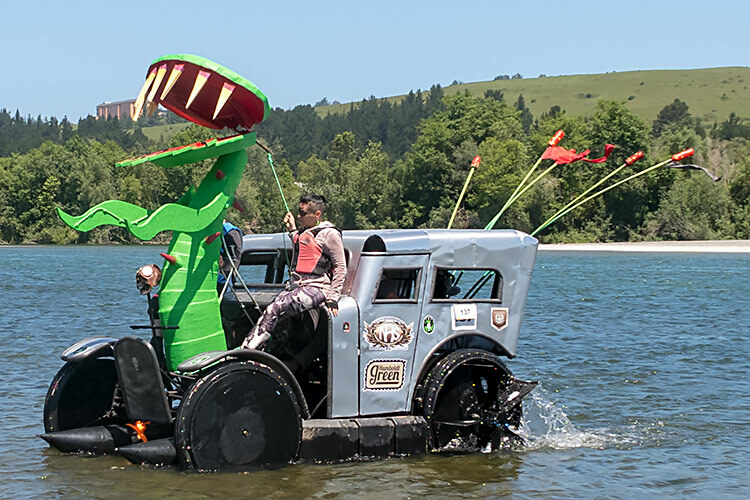 Consisting of an actual Ford with the guts removed, U.S.S. 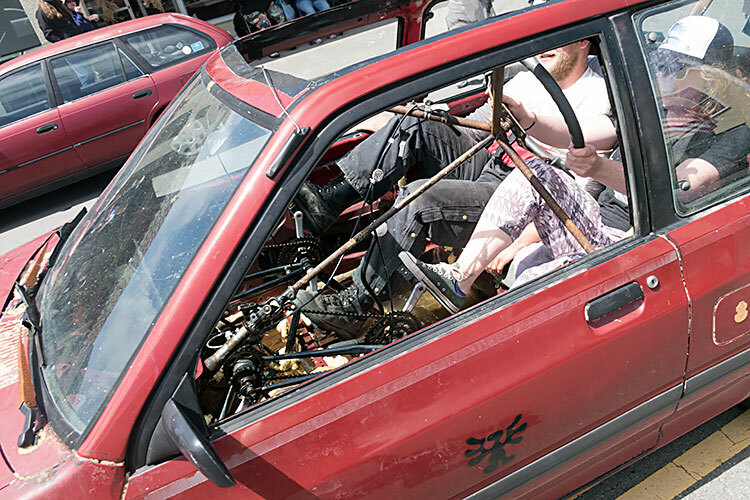 Festiva demonstrated far more panache than speed. 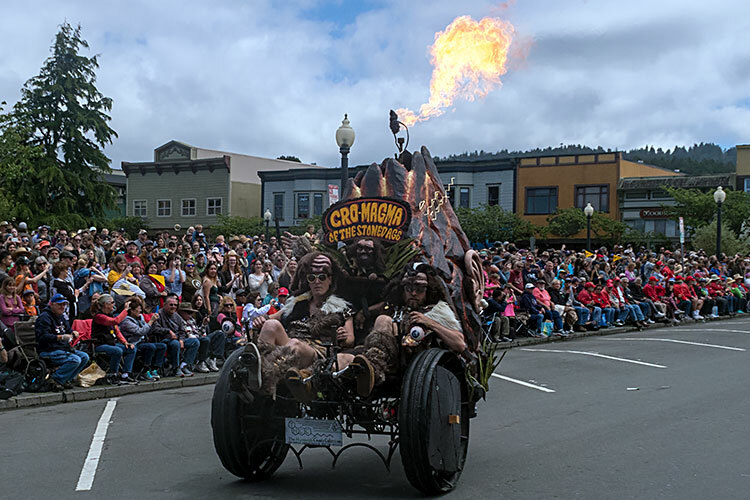 Cro-Magma of the Stoned Age was a 3-wheeled flaming tricycle with pontoon frame visible underneath. This Goes Gold had 10 pilots: 4 on each side facing out, and 2 in front. 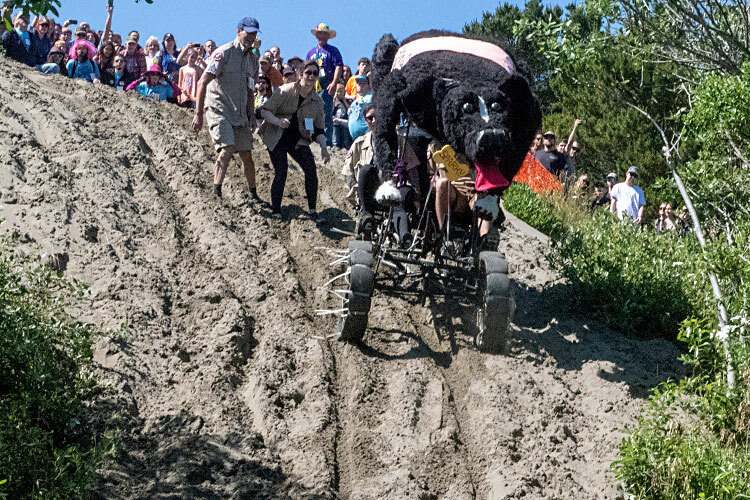 Hoosier Dirt Oval tires are popular for their broad traction surface, reasonably low rolling resistance on pavement, and buoyancy. 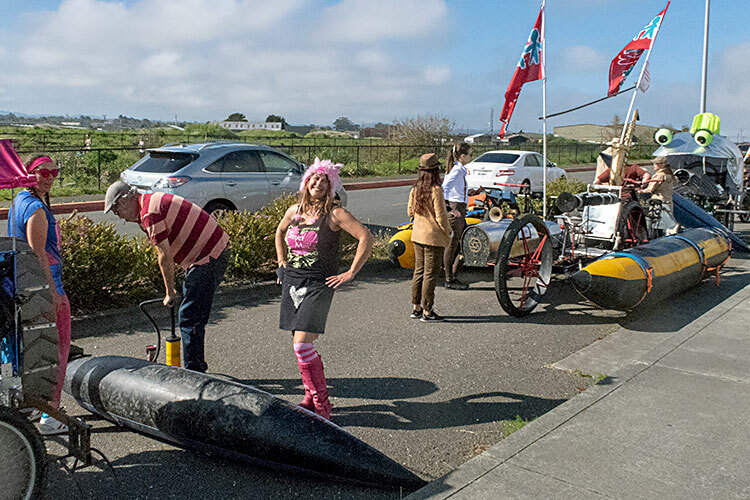 Immediately after leaving the Arcata plaza, the racecourse goes through a couple of blocks of orange plastic fencing. 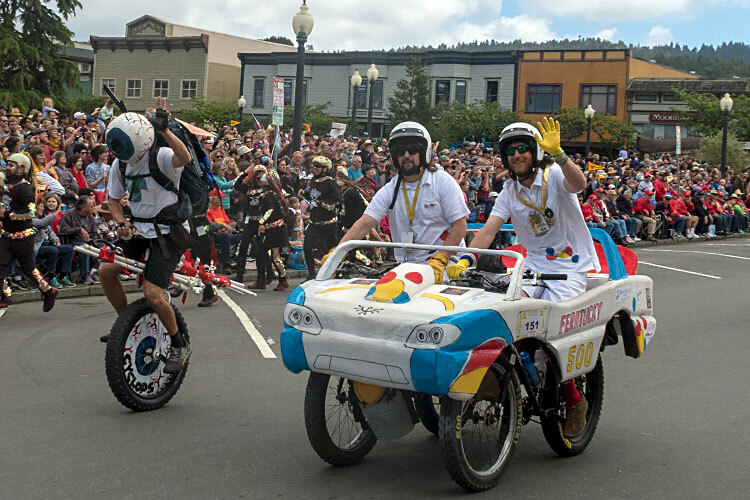 New Mexican Roadrunner is Jon VerPloegh’s celebration of his home state and 30 years of kinetic racing in Boulder, Colorado. 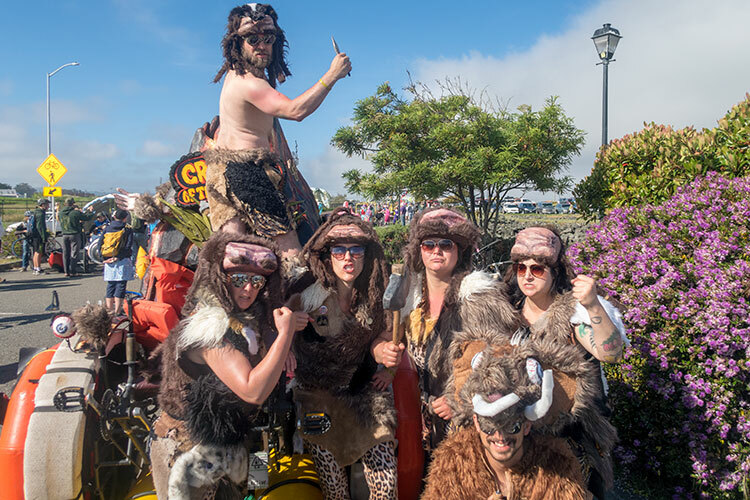 They were also set to win the Golden Dinosaur Award for being the first to break down after leaving the plaza, in this case making it less than one block downhill. 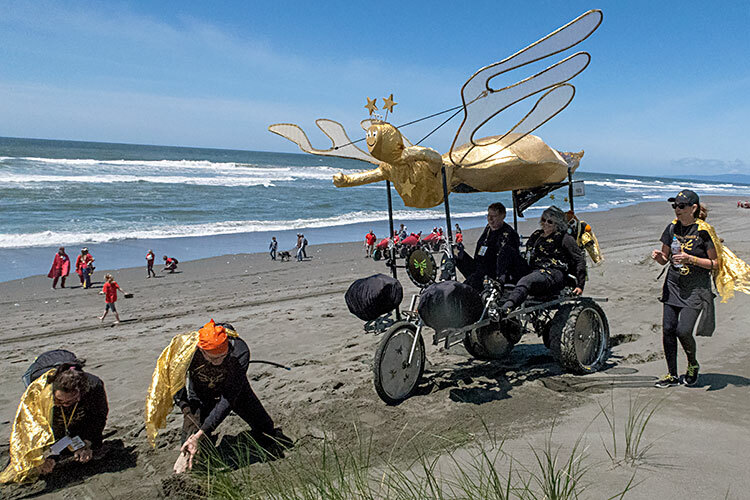 From Arcata, the racecourse heads to the Pacific beach, where racers stay fairly close to the water where the wet sand provides better traction. 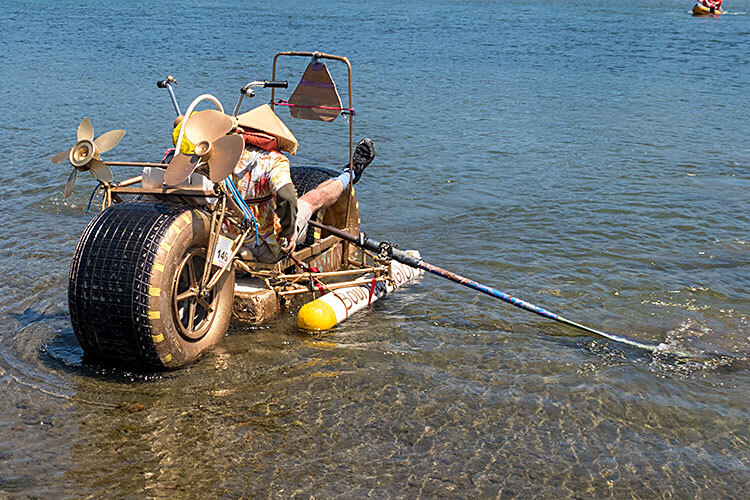 Melvin has switched to much broader sand tires. 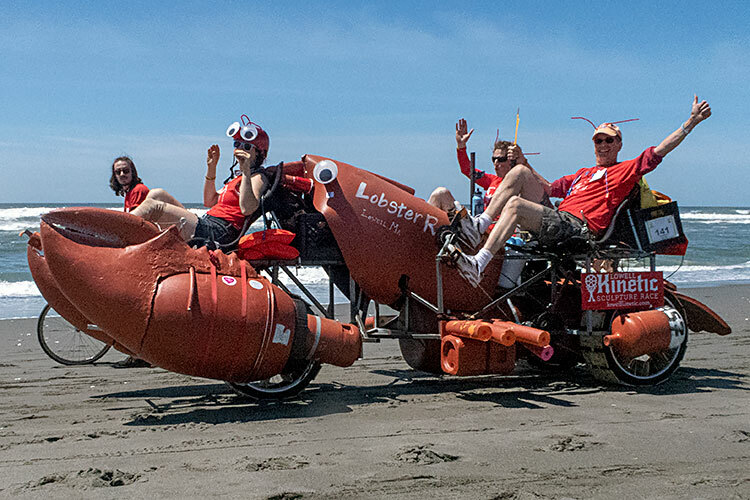 All the way from Massachusetts, Lobster Roll celebrated the Lowell Kinetic Sculpture Race. 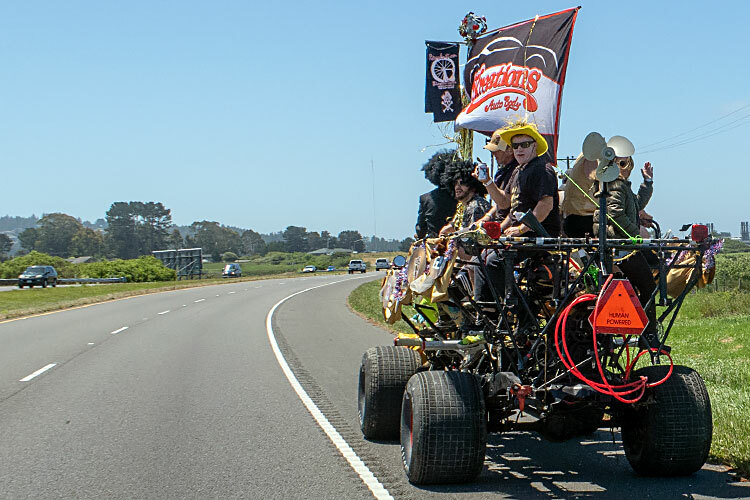 Even a broken trailer axle in Redding didn’t stop them— support from other Kinetic racers got them to the starting line. 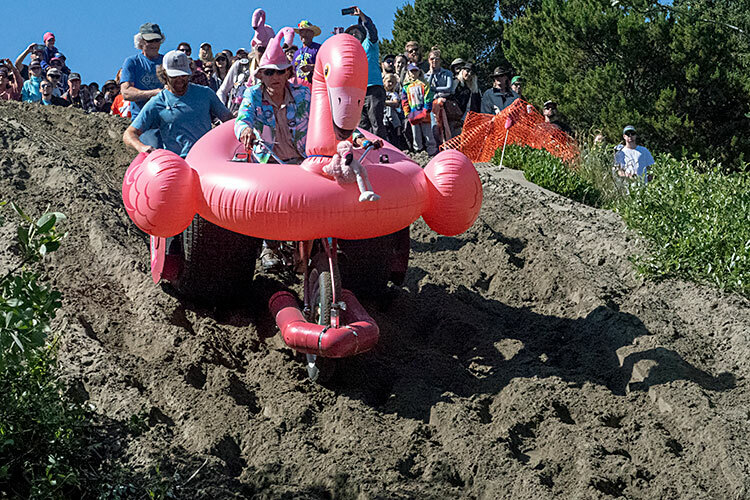 Mother nature and Hobart conspired a bonus beachy challenge. 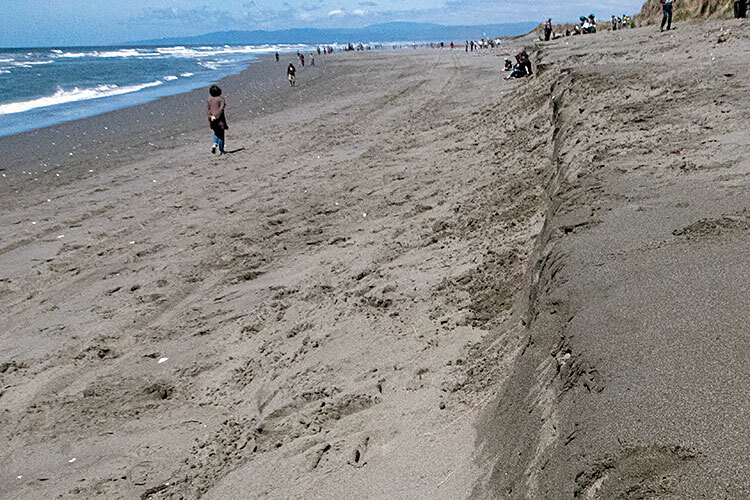 A prior storm left a steep shelf extraordinarily difficult for sculptures to traverse. 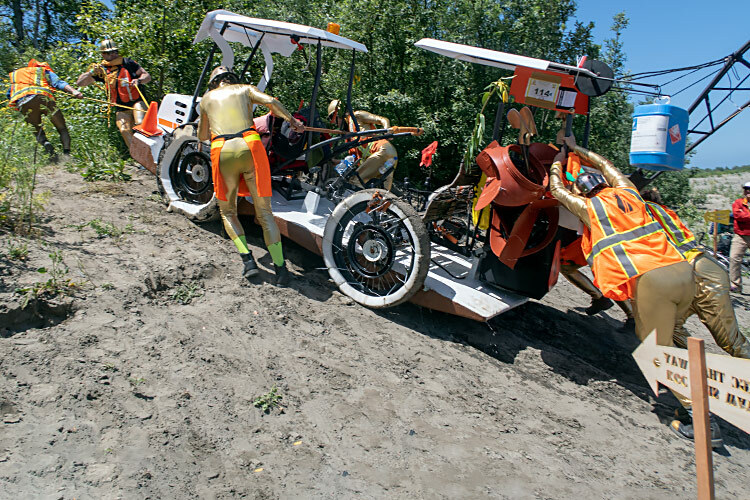 Team Goddess Star Power had pit crew smooth out the sand in front, a perfectly legal maneuver you’ll see more of later. 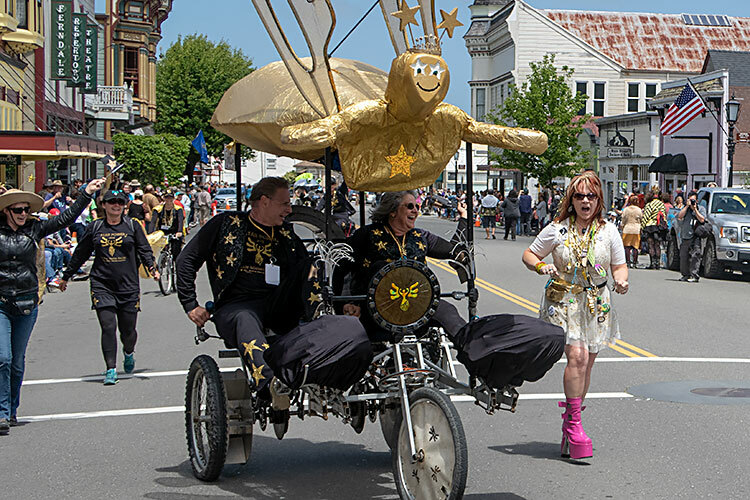 Bounce For Glory Golden Edition has a wickedly simple propulsion system: the rear axle is mounted off-center, so Peter Wagner has bounced along the racecourse for decade after decade. 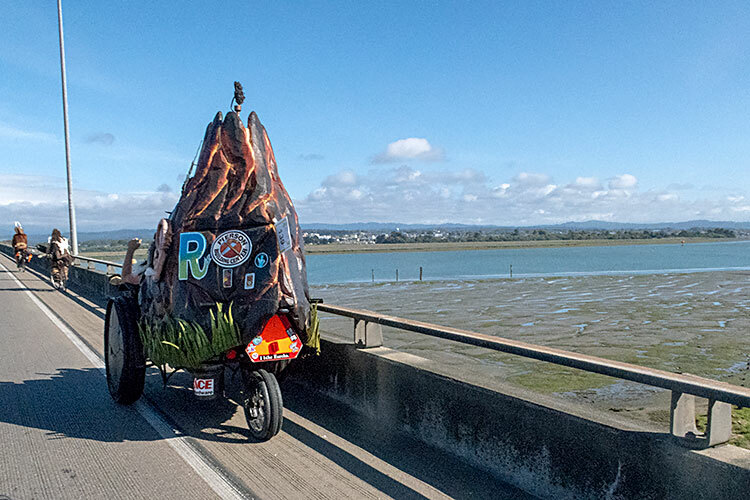 You won’t often see sculptures heading North along the beach. 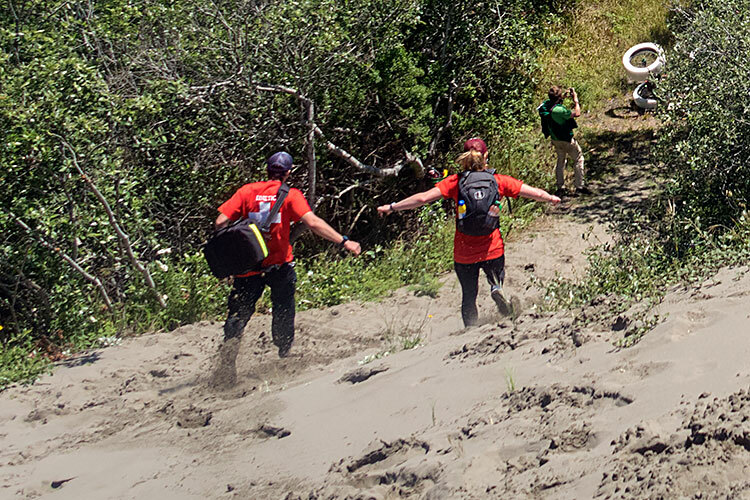 Bounce for Glory pioneered a path taken by many ACE teams to get around the shelf by continuing south past the cut-in to Dead Man’s Drop, then climbing up and doubling back north. 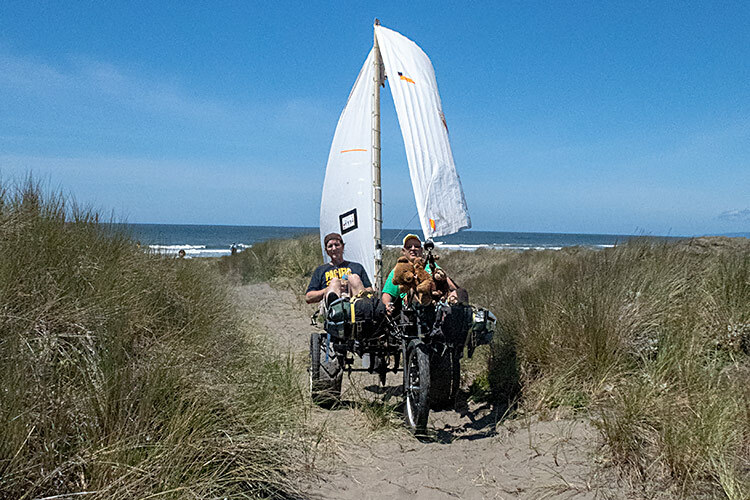 Flying Spaghetti Monster (Plan C) with a large sail also had a new front wheel system specifically designed for greater speed through June’s Dunes. 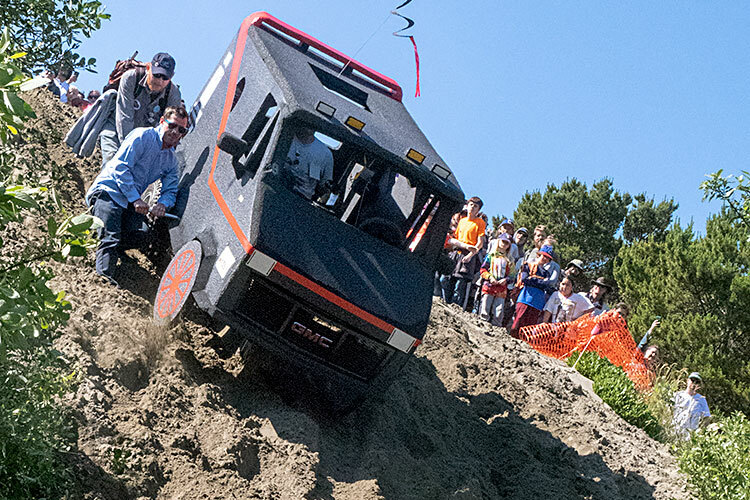 As in Baltimore, Kinetic Kops traverse the course looking for citable offenses. 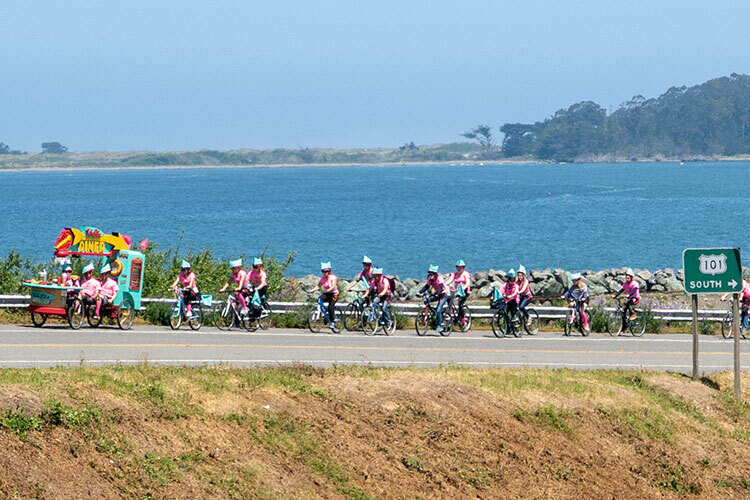 …with good cause. Seconds later, The Rusty Pickle flipped over and the Medics dashed in to provide first aid. 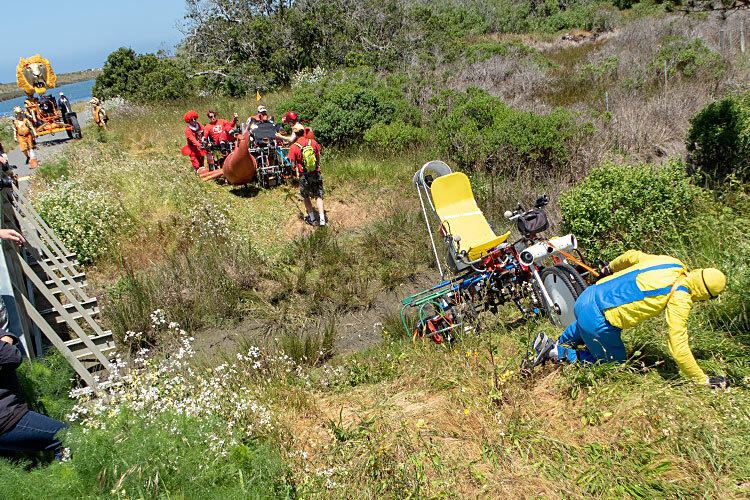 After a crash, Kinetic medics first ask “Are you ok?” like medics anywhere. But if the answer is yes, their next question is “Are you ACEing?” and if that answer is yes, they provide a treatment regimen that preserves ACE status. 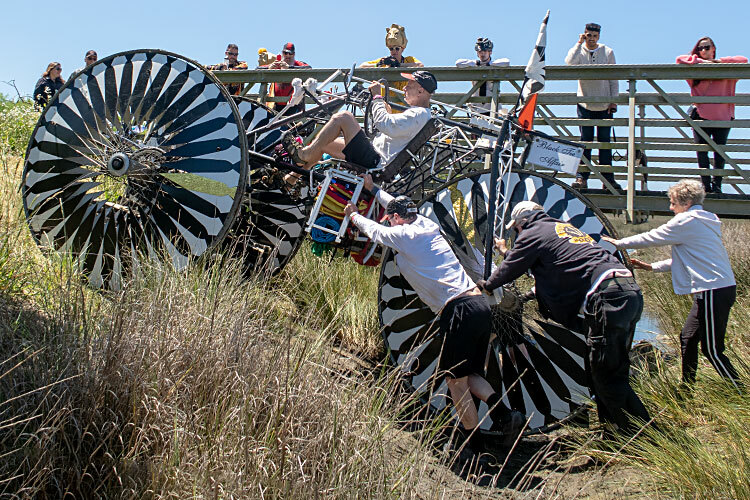 For instance, they have to determine where the sculpture stopped, so once it’s flipped back over, the team can resume without improper advancement. 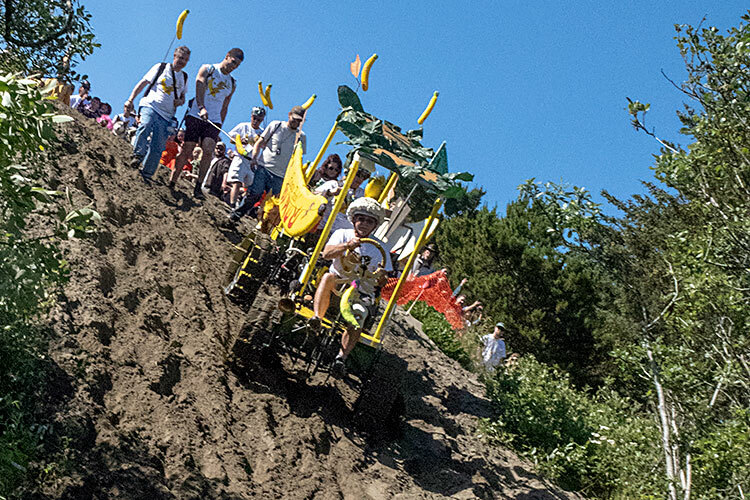 Rusty Pickle won Golden Flipper (Sand). 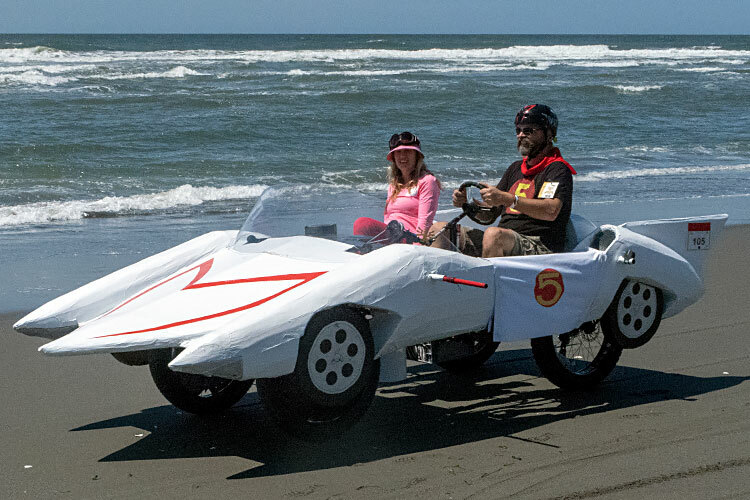 Keep your eyes on Speed Racer. Even though they’d aced 4 prior years, you’ll see it would soon be towed. 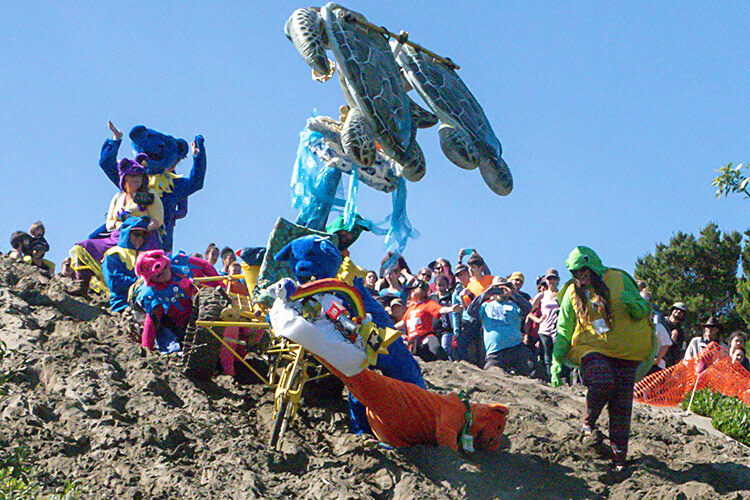 Team Goddess Star Power had one of the most dramatic sand crashes. 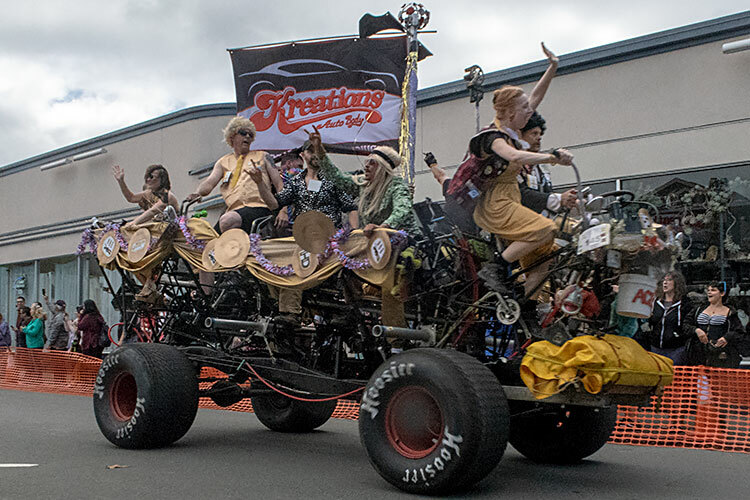 Melvin cruised straight down in their proven machine. …and flipped completely upside down. 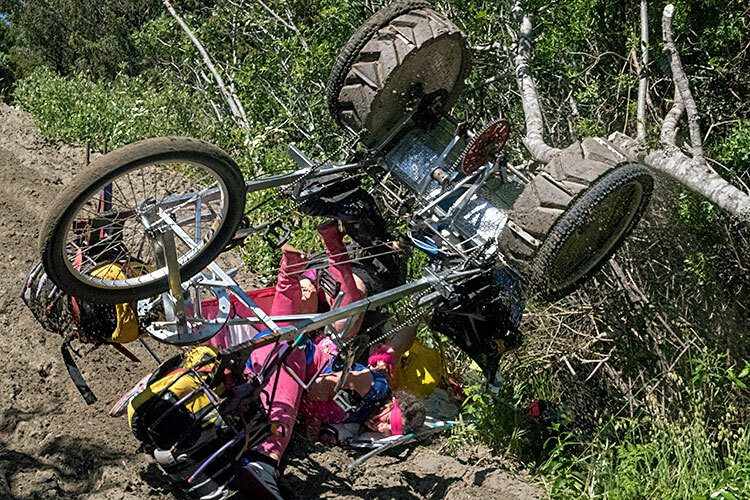 If you brake too hard on the way down, you risk flipping. A Toast to Hobart came close. 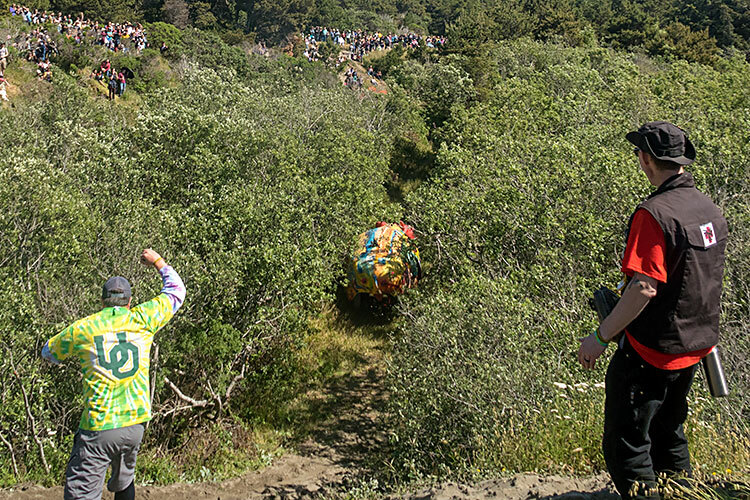 Despite the SLOW warning sign, Caltrans Solid Gold Pineapple Wrecking Crew went wildly out of control and crashed into the bushes, running straight over a fellow photographer in the brush. This shows the extraction, as Tom missed the action shot diving out of the way. The photographer was unharmed, but the camera suffered. 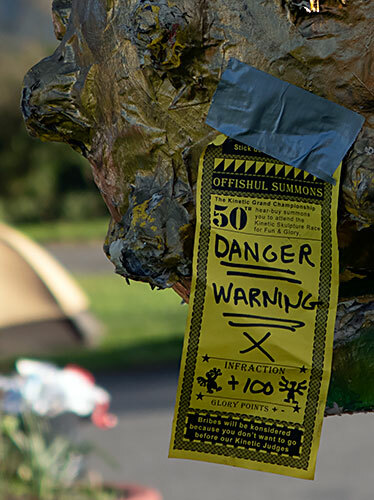 Take heed: Art is Dangerous! 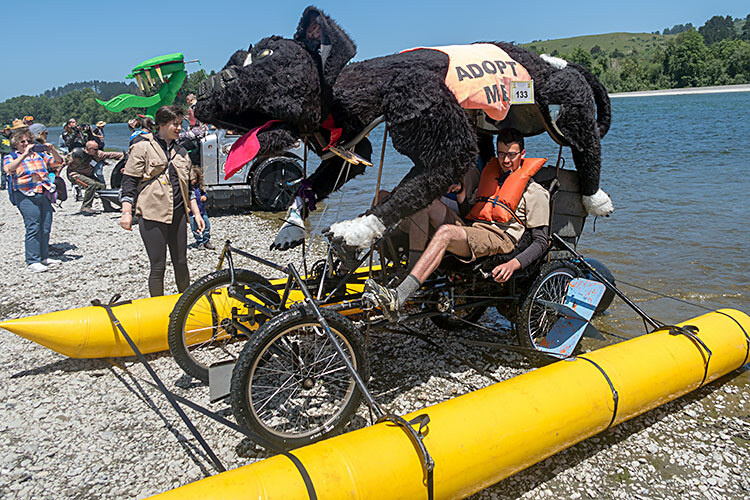 Sparky the Rescue Dog has raced 8 years and achieved 3 ACEs. 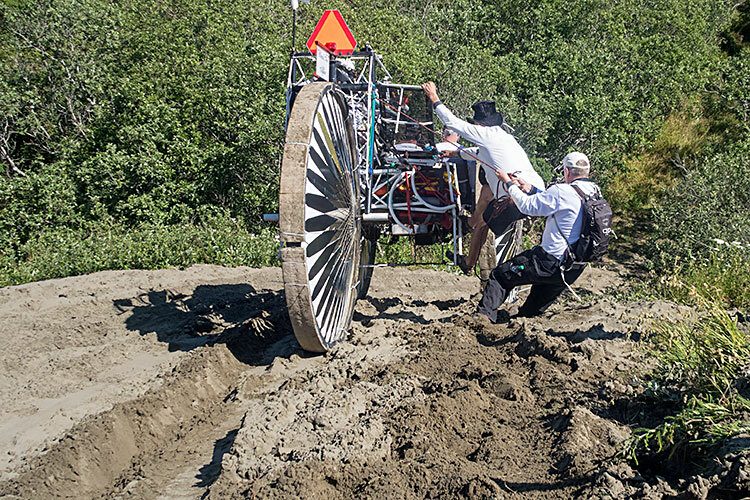 Foam sand tires are held on with zip ties. 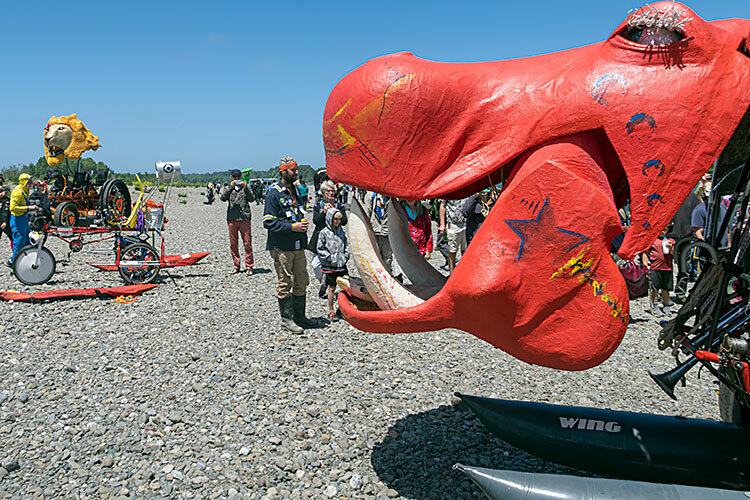 For larger sculptures like Hippypotamus, the safety team joined hands to create a barrier separating the crowd from errant sculptures. 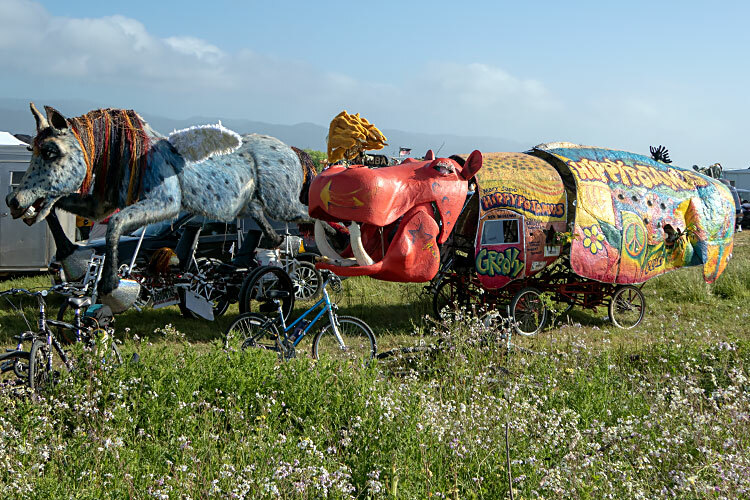 As one of the tallest and widest sculptures, Hippypotamus also pushed aside the overgrowth. 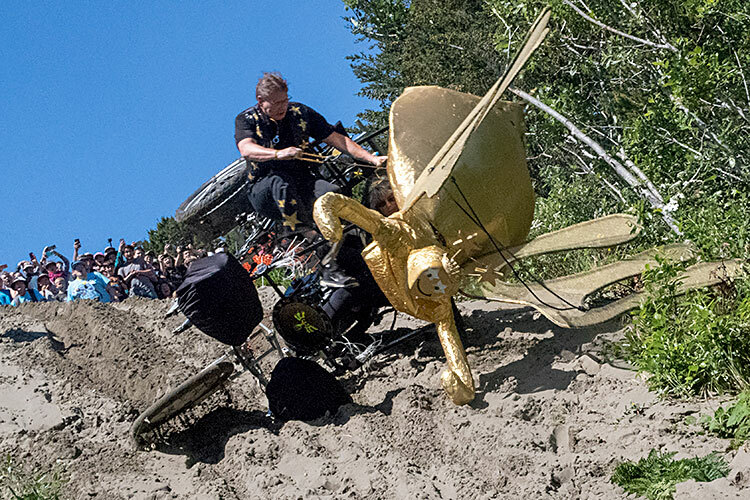 To avoid the fate of prior high center-of-gravity sculptures, Black Tie Affair went down with one pilot serving as ballast around the curve and a rope to keep it from tipping over. 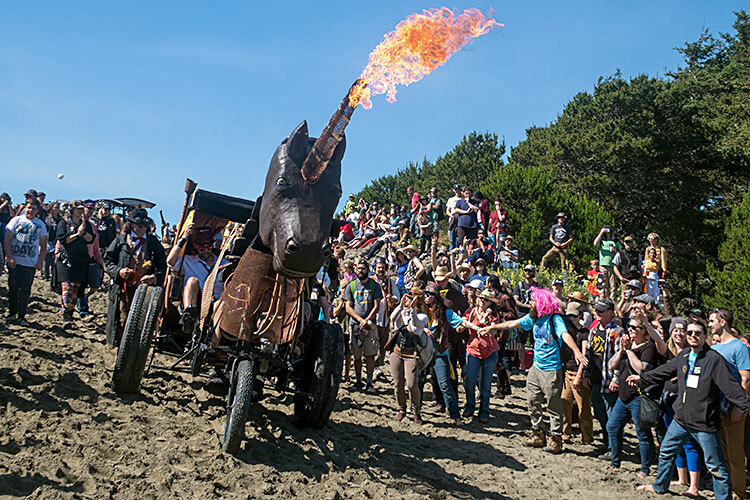 Two-pilot Norman the Half-Fast Unicorn used the same tires for the entire racecourse and shot fire from his horn. 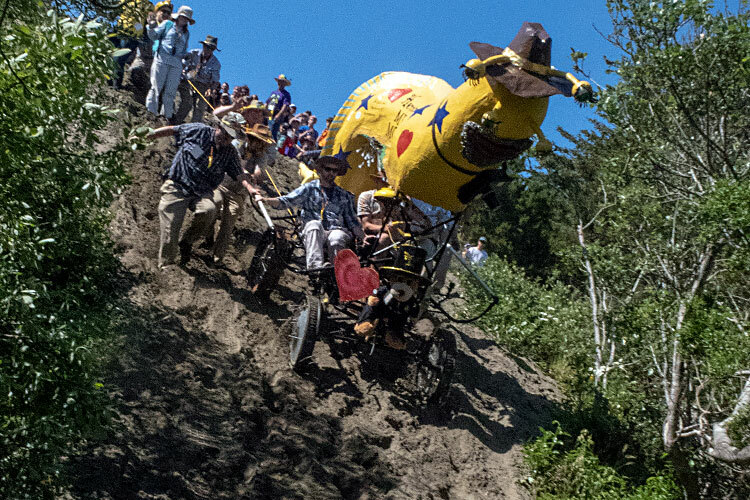 The Monster Zinc team has raced 16 years. 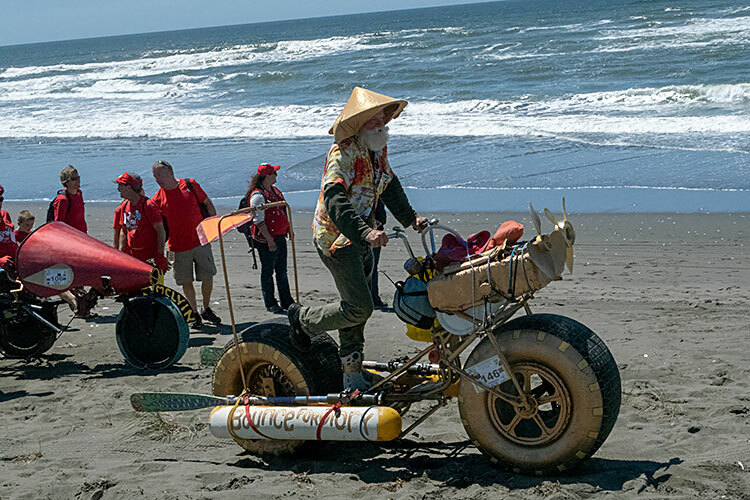 Team Tempus Fugitives’ Glory Diver has aced 5 years, and shows another challenge on the first day: brush between the sand and roadway. 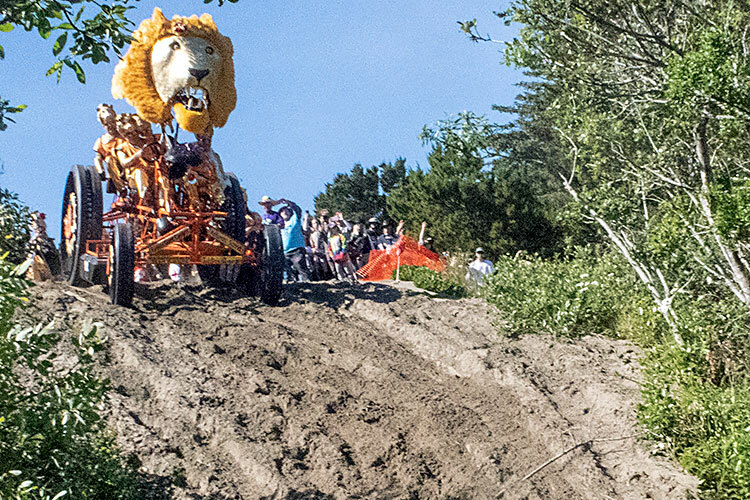 The great foam and papier mâché cat head atop Lion Kings reached 13 feet tall and glared down the slope. The Fledgling Flamingo Flyer went down slowly. Herrmann’s Merry Mollusk bears a hat, beard, and camera commemorating Herrmann Spetzler, founder of Open Door Community Health Centers who passed away in March. 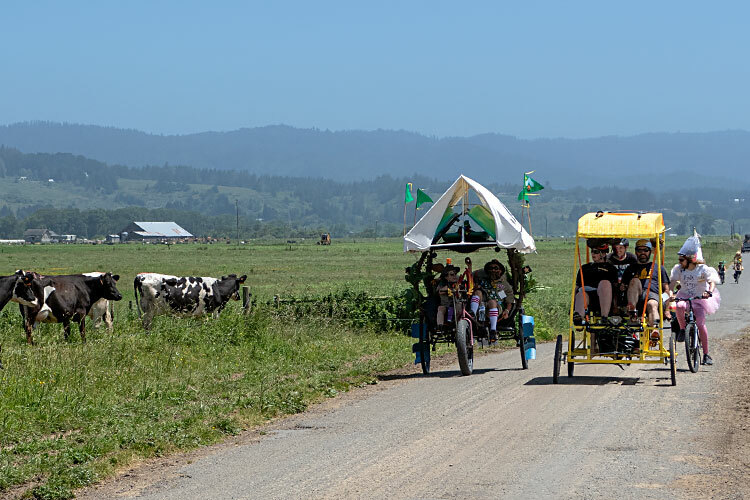 Yellow Brick Rode was racing for the first year. 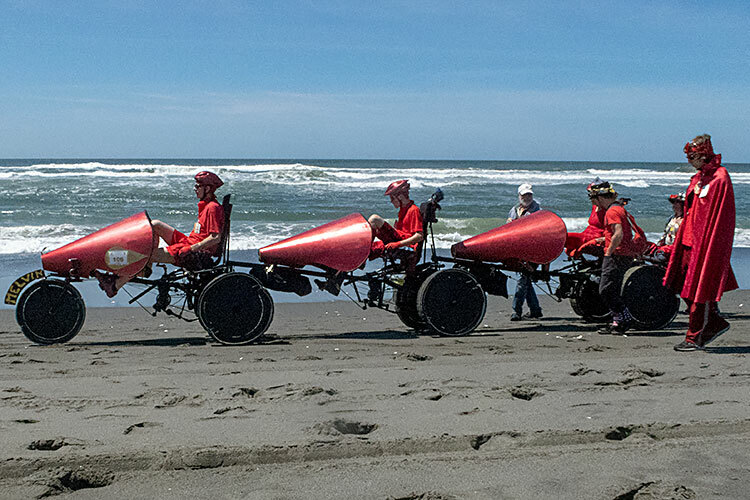 The team for Cyclops evened the sand using a cardboard sled with 2-passenger weight. Cyclops came down the smoothed path. 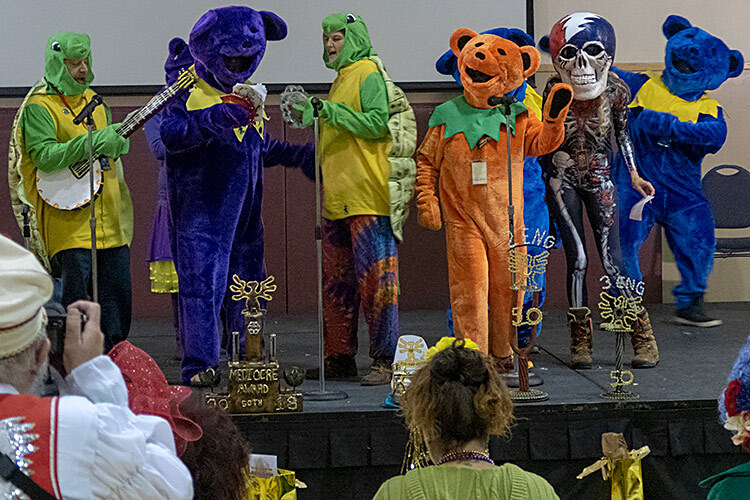 Team Terrapin’s Let My Inspiration Flow featured dancing bears, a catsuited deadhead, and inflatable terrapins. Banana Flash used broad rigid plates for sand traction. 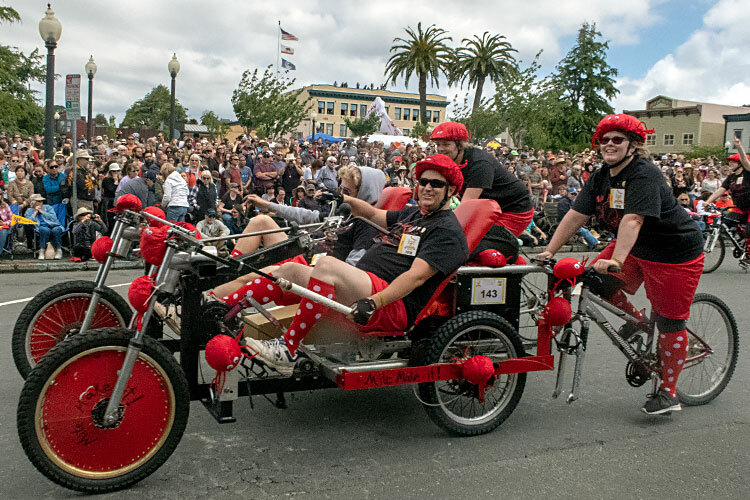 The A-Team required aggressive human brakes. 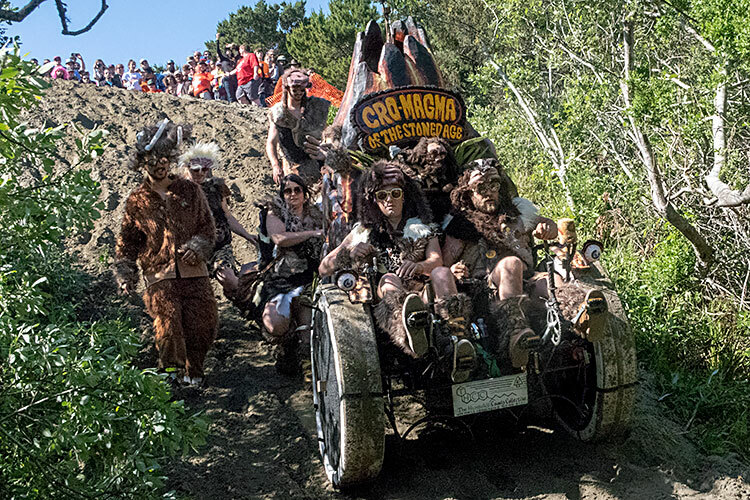 Cro-Magma of the Stoned Age easily drove down the slope. 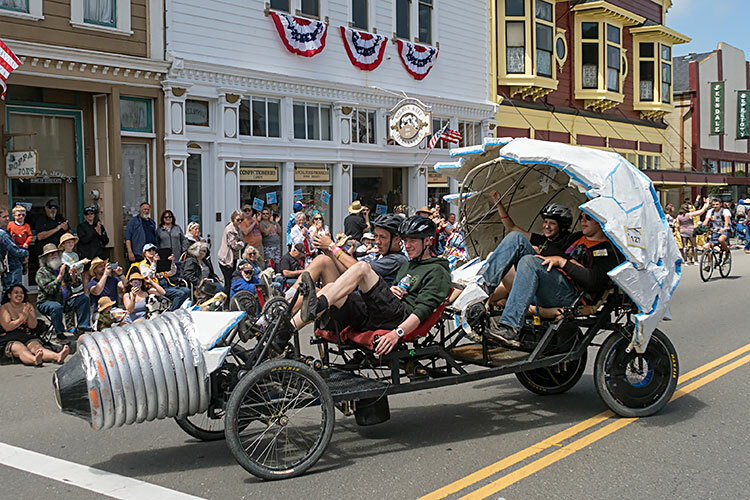 The Dimlits team from Colfax High School piloted a shattered light bulb through the race, taking great care down Dead Man’s Drop. With a high center of gravity, Sparkle the Horse had two rope lines: one in back to slow her, and one on the front right to keep her from tilting left on the right turn. 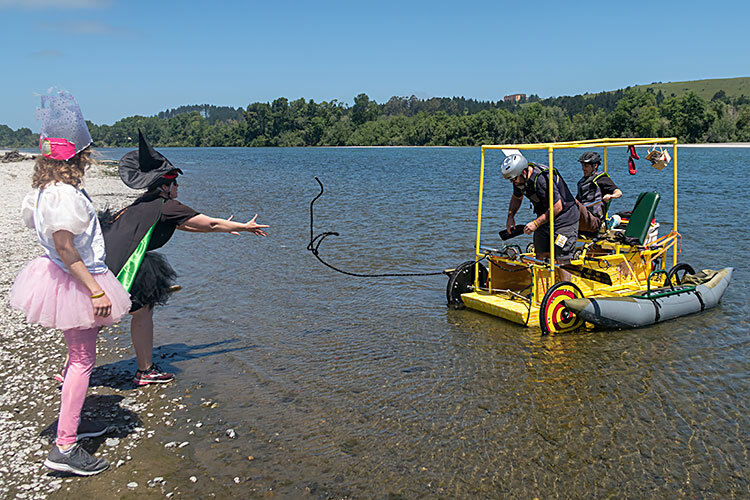 Gilded Ghost Guild aka Kinetic Paranormal Society also went down with tow lines. You can see the sock puppet here. 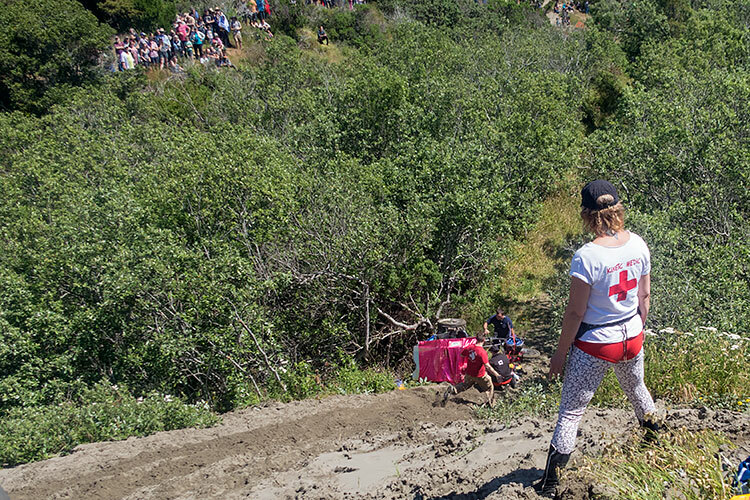 One of the last teams to descend, New Mexican Roadrunner got guidance from a medic. 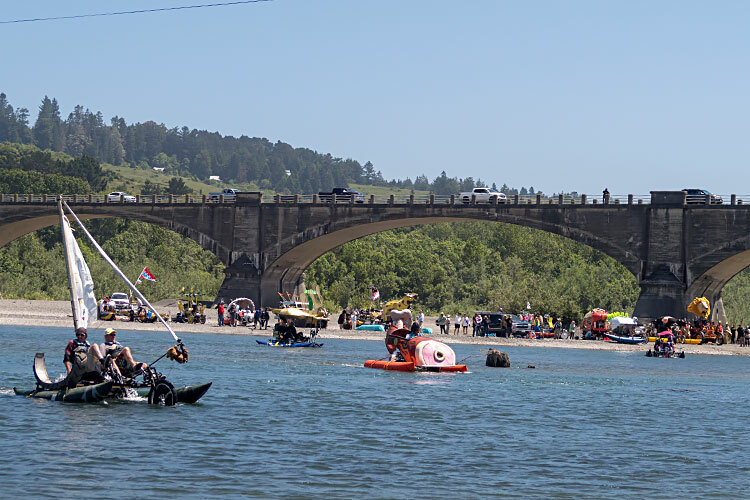 After Dead Man’s Drop, the racecourse crosses Samoa Bridge into Eureka. 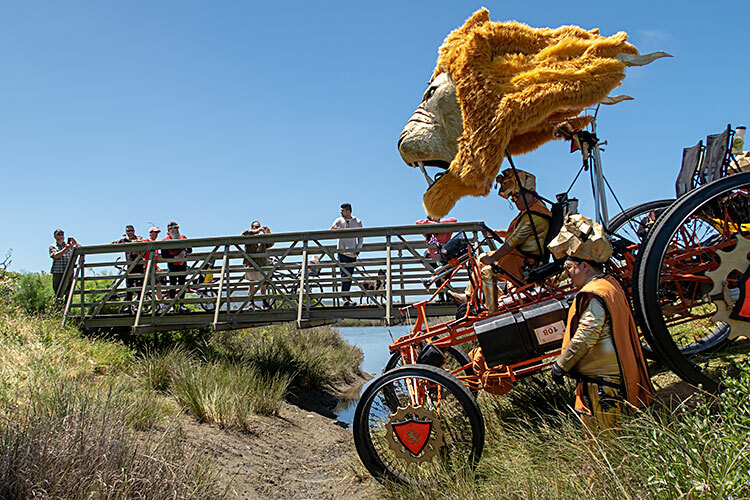 Here Kinetic Encounters of the Fiftieth Kind makes the trek for their twelfth race. Cro-Magma of the Stoned Age didn’t quite fit on the shoulder. 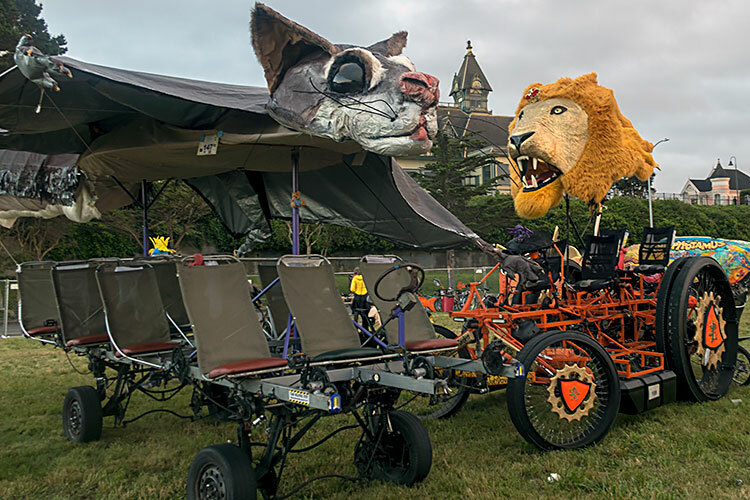 At sunset, most teams, including Flying Squirrel and Lion Kings parked for the night below Eureka’s Victorian Carson Mansion, completing Day 1 of the 3-day race. 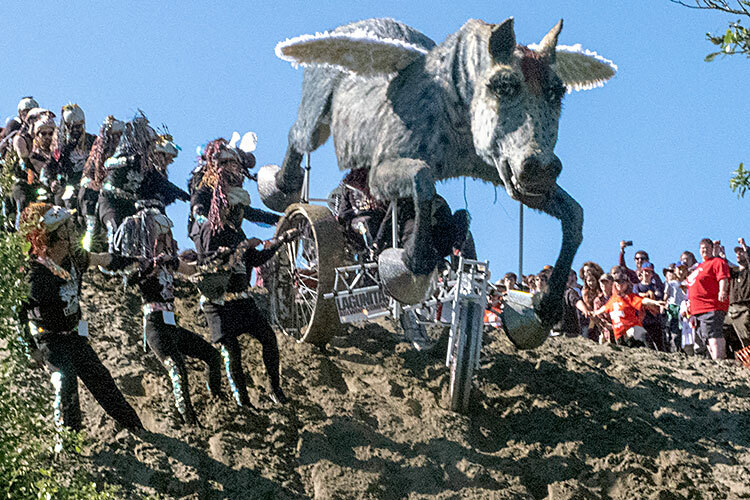 The following morning, crews began the work to transition their sculptures for the water entry. 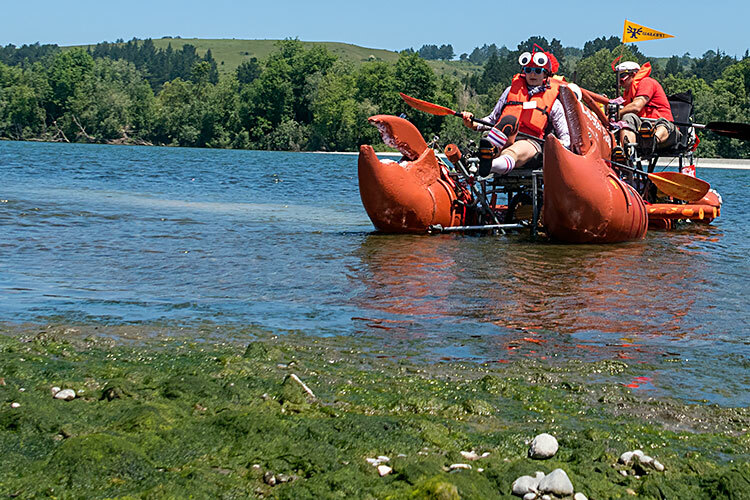 Team Super Moi inflates pontoons while Swing Kids already seems ready. The Ominionated II pilot talks to Ramp Meister during inspection while Untermeister Kop looks on. Cro-Magma of the Stoned Age had time for a team photo. Silver Streak was so early and so fast through the water, we only saw them returning South again. 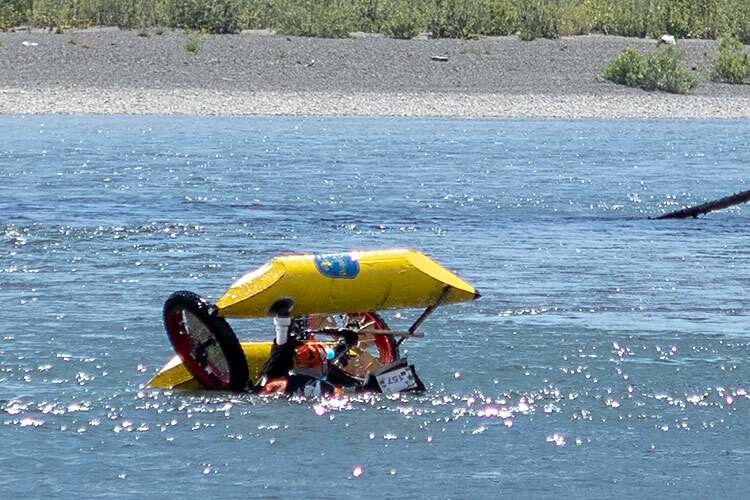 Team Tempus Fugitives capsized last year. 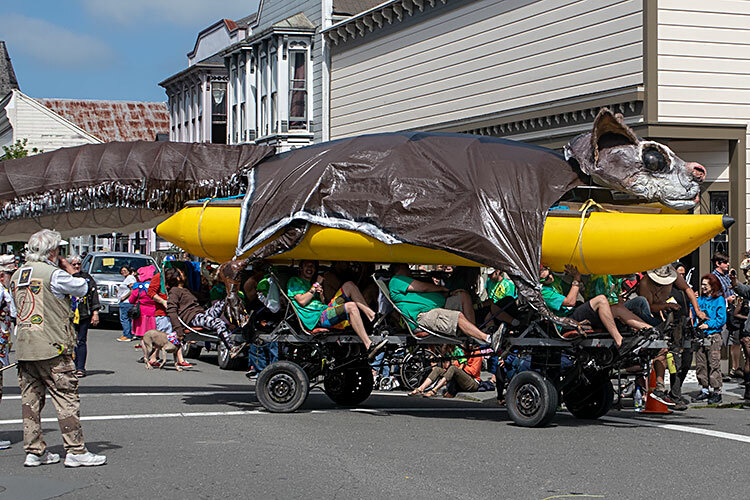 This year they rebuilt ’ Glory Diver with a submarine theme. 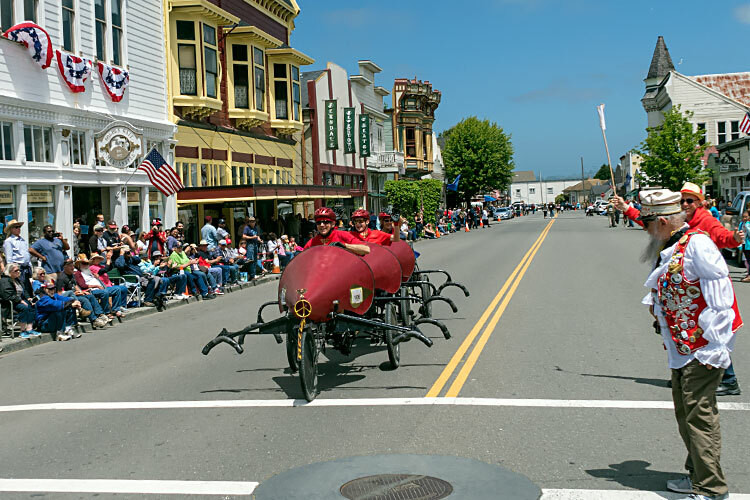 They had awesome antique deep-sea diving helmets at the pageant (you’ll see them below), but not in the race. Team Goddess Star Power had a very easy water entry. 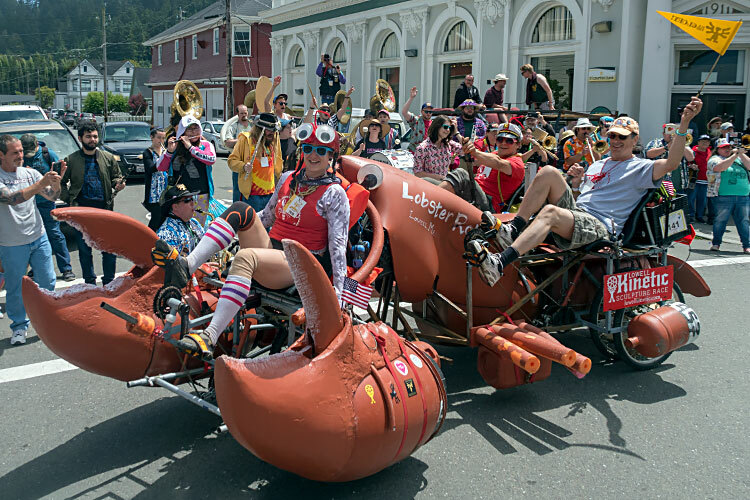 Lobster Roll entered the saltwater as easily as you might expect a sea crustacean. 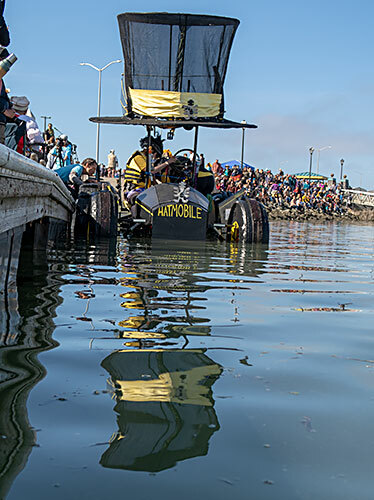 The Rusty Pickle entered the water smoothly at first, but moments later the pontoon rods started folding like a cardboard mizzenmast. 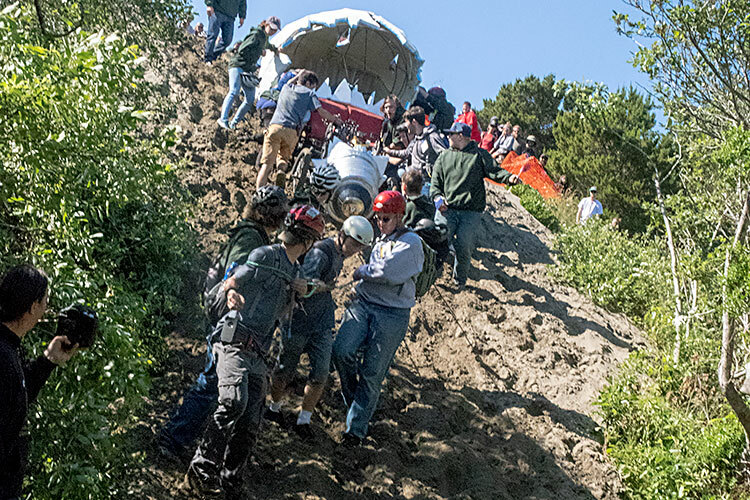 There’s a pilot under there somewhere, who came out ok. 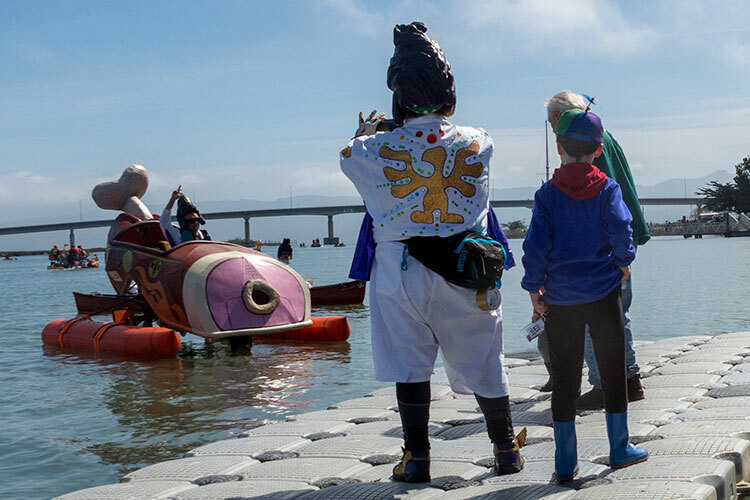 This is the same catastrophic structural flaw occasionally found in Baltimore: on land, the structure holding the pontoons to the sculpture bears the weight of the pontoons (usually a few dozen pounds of foam). But on water, that same structure suddenly bears the weight of the entire sculpture, and isn’t always up to the task. 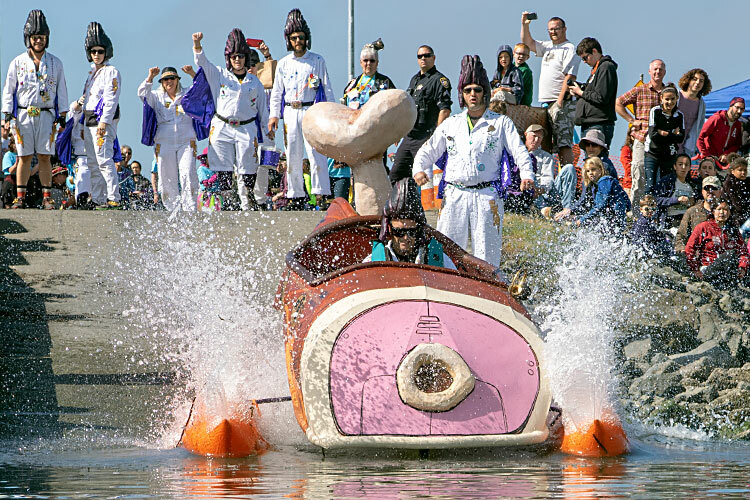 Hunka-Hunk-A Burnin' Ham: Glazed for Glory was an all-terrain 3-wheeled cartoon ham with a wiggling bone, piloted by a team of rhinestone-caped Elvises. 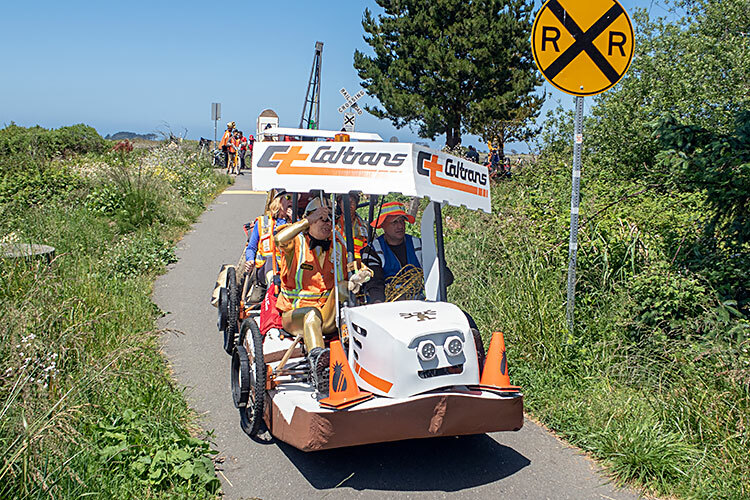 The team for Mad Plants—Beyond ThunderClone has raced 9 years (4 with this chassis), and ACEd once. 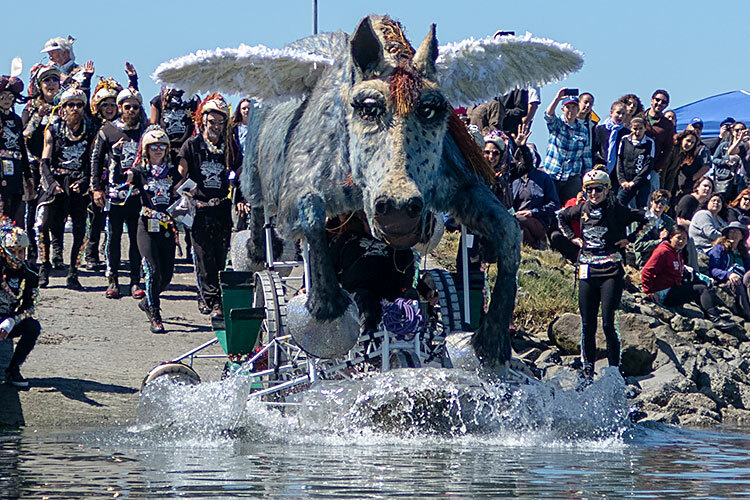 Sparkle the Horse dove into the water with extensive pit crew looking on. 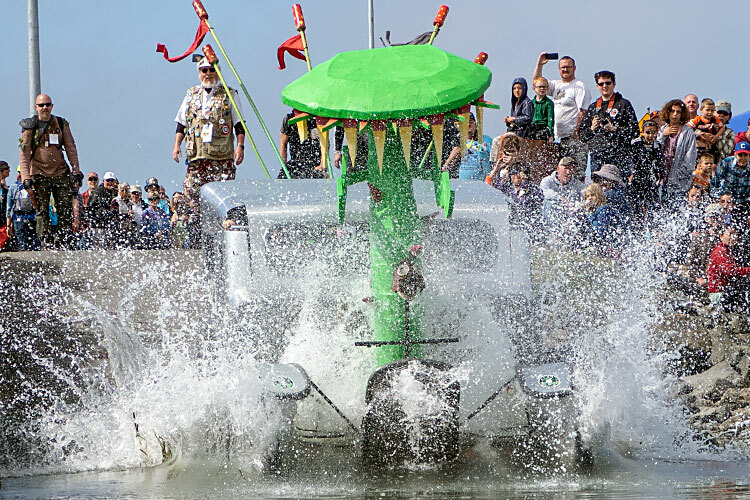 Flying Innuendo demonstrated an artfully sculpted splash. The hat on the left crowns Bob Buerger, who’s raced many years in Baltimore too. 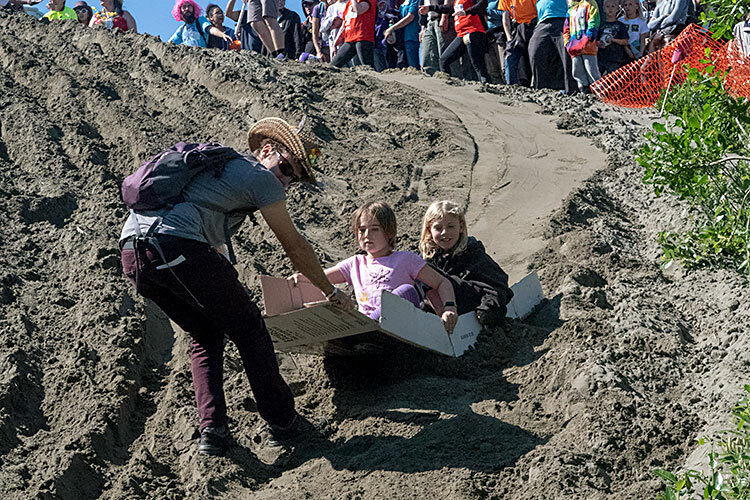 The water entry did not go smoothly for Yabba-Doo-Ya. 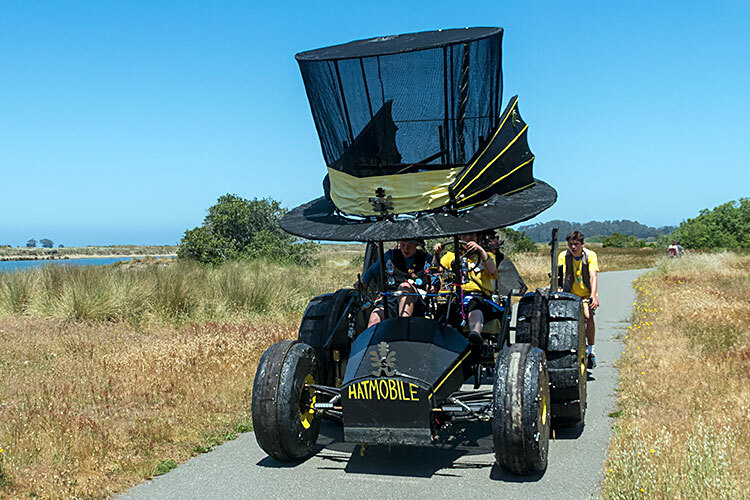 Hatmobile was built last year by 2 teenagers. 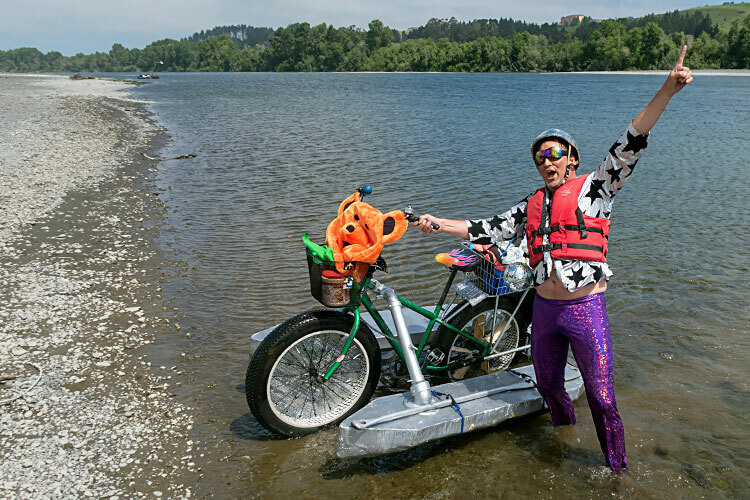 #discodarren was a fat-tire bike with pontoons and sparkly purple trousers. 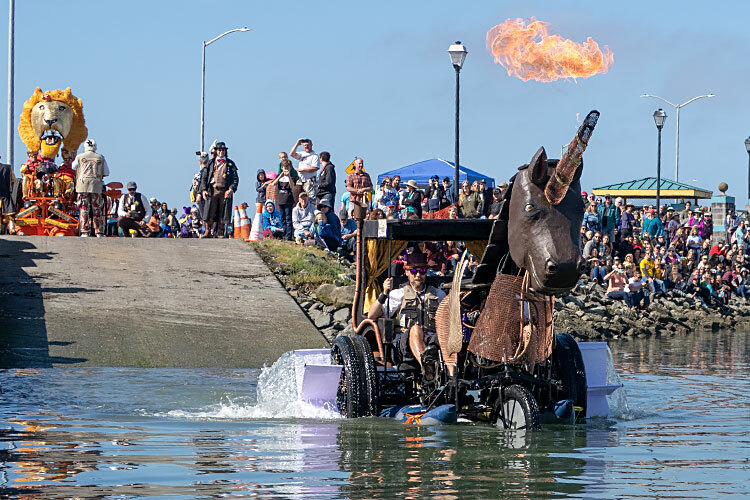 Norman the Half-Fast Unicorn hit the water with large paddlewheel attachments and more flames. 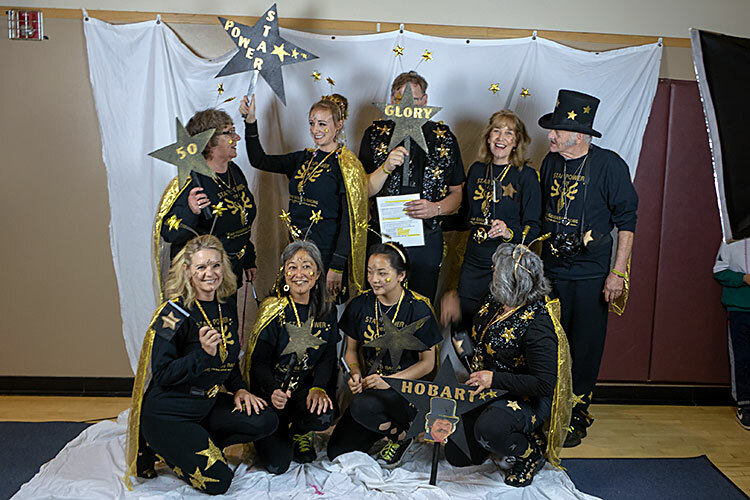 Norman won First Place Spirit of the Glorious Founder. 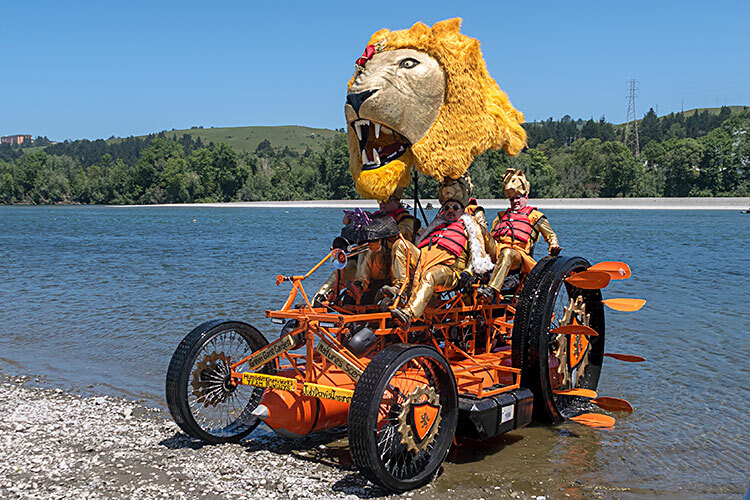 With 8 oars attached to each wheel and a sword, Lion Kings was ready for the water. 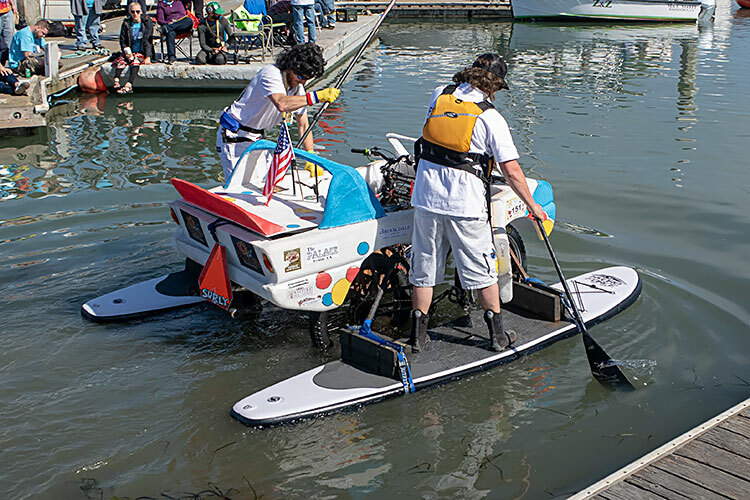 Ferntucky 500 used stand up paddle boards as pontoons and pilot-bearing running boards. 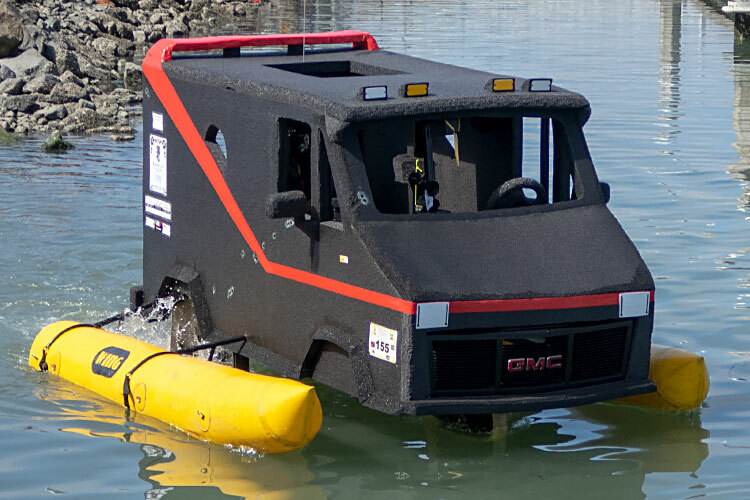 SUPs have not yet been seen in Baltimore. 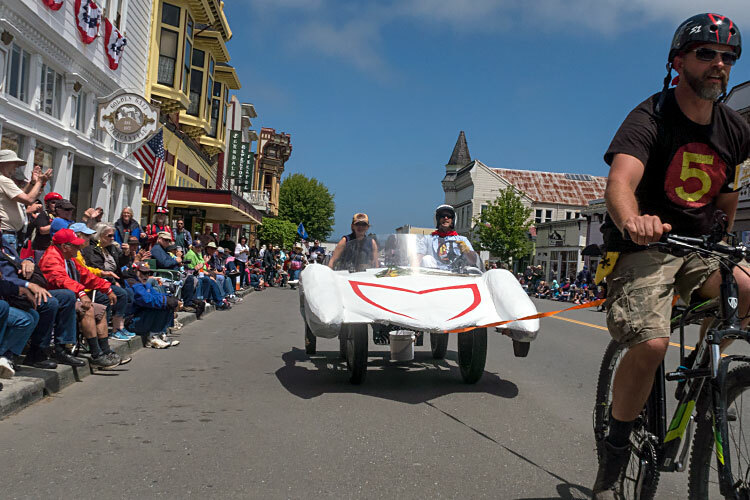 Ferntucky 500 finished the race winning First Place Speed. 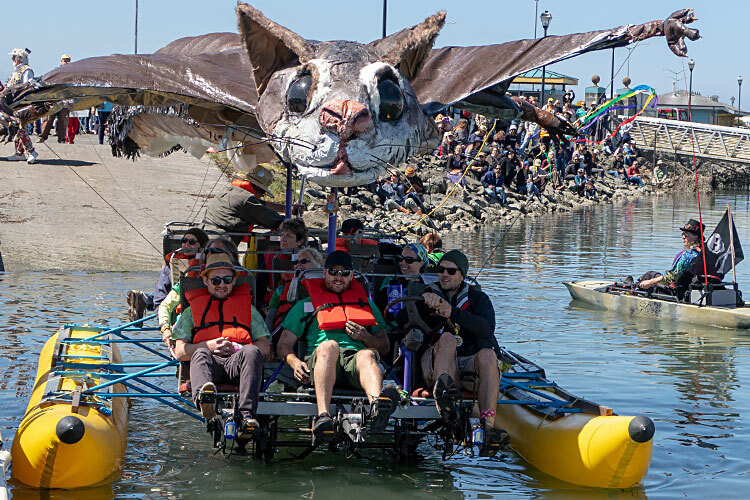 Cloud of Unknowing—Flying Squirrel shed some of its pilots as they drove into the water, but they scrambled back aboard once it was afloat. 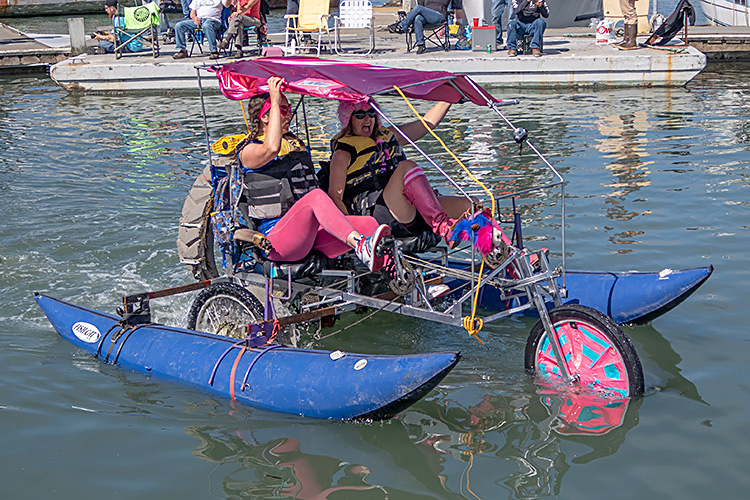 Black Tie Affair was very graceful with gigantic blue pontoons. 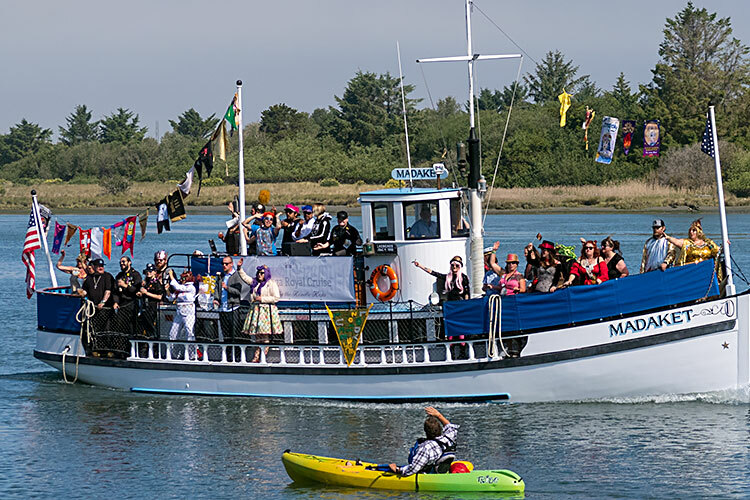 Rutabega Royalty partied at the water entry aboard their own yacht. 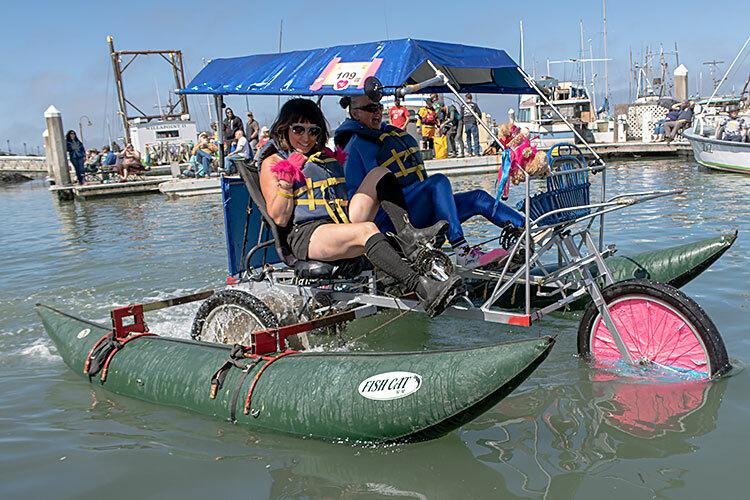 Happy Campers joyously pedaled their amphibious tricycle tent. 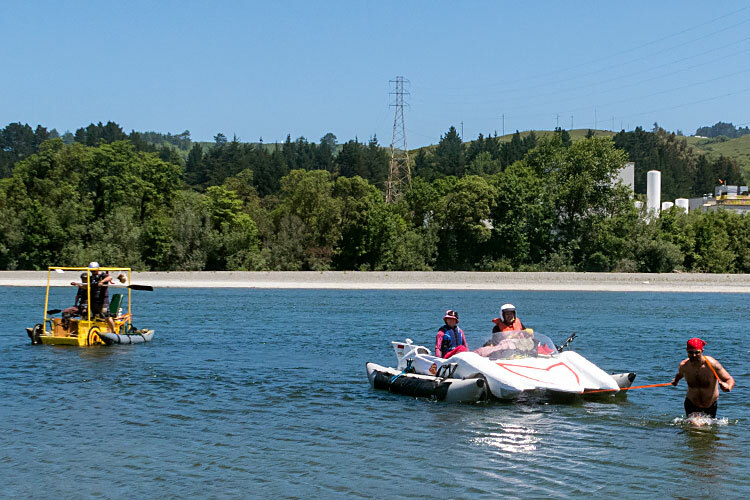 They were riding low with enclosed kayak pontoons that were mostly submerged. 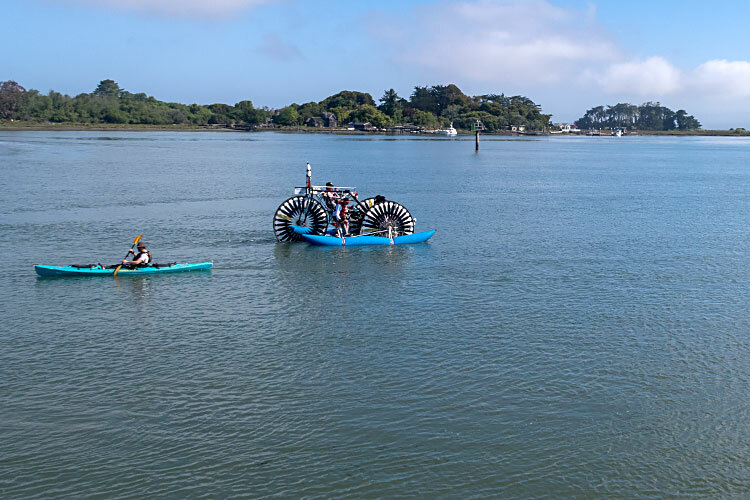 Dimlits also had mostly-submerged paddlewheels, but plenty of pontoonage to spare above the surface. 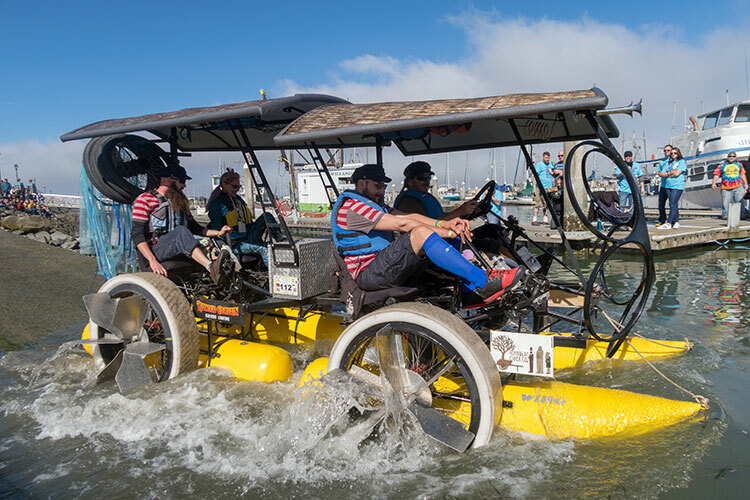 Caltrans Solid Gold Pineapple Wrecking Crew took to the water with 4 powerful Whittaker paddle wheels. Just as in Baltimore, in order to ACE you have to bring everything with your sculpture all the time. 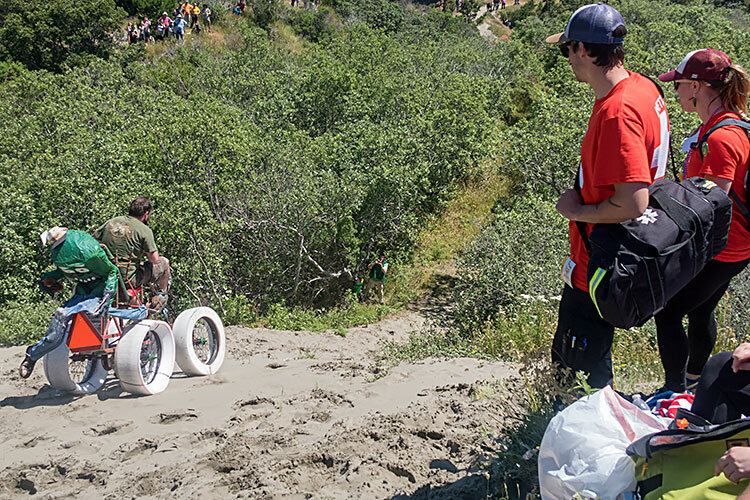 If you have sand tires, you need to carry the sand tires with you for the entire racecourse, even the water. 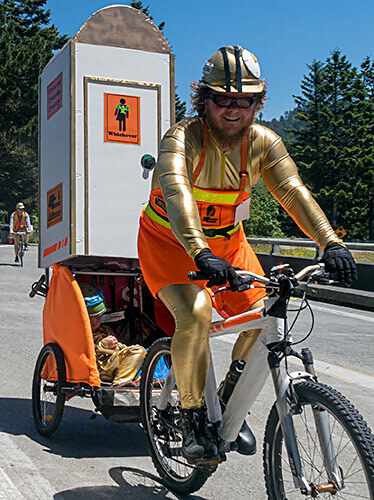 Caltrans Solid Gold Pineapple Wrecking Crew had a “Trans Porta Potty” as their cargo vehicle that also carried their youngest team member. 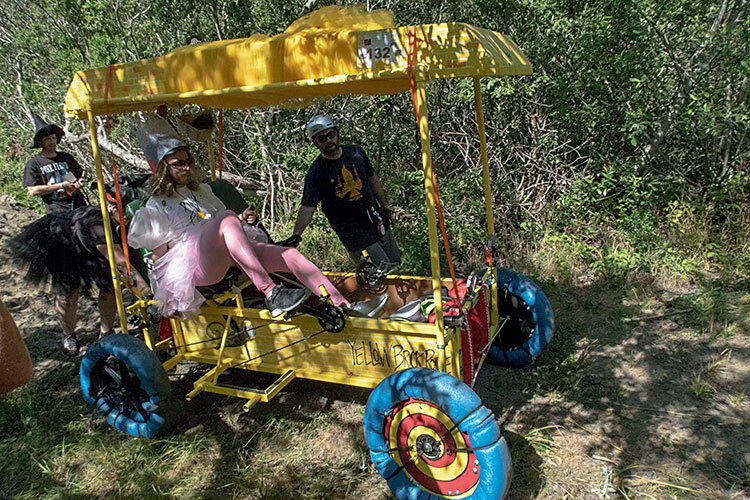 They received a ticket for their solid gold wrecking ball swinging wildly around the unsuspecting public as they drove on land. 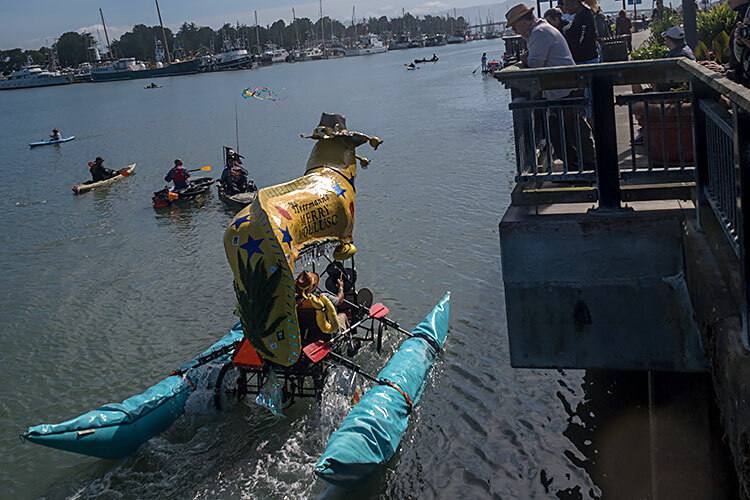 Team Terrapin brought the inflatable turtles onto the water, but not the dancing bears. 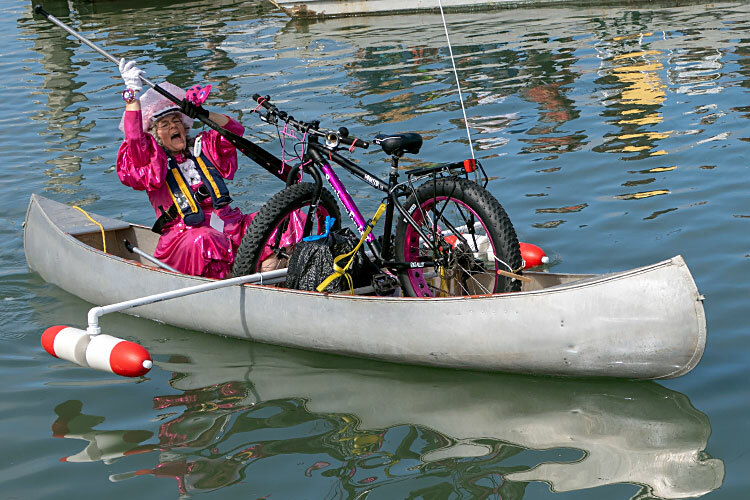 Raspberry Fembot put down her ukulele when she picked up her paddle, but continued singing on the water. 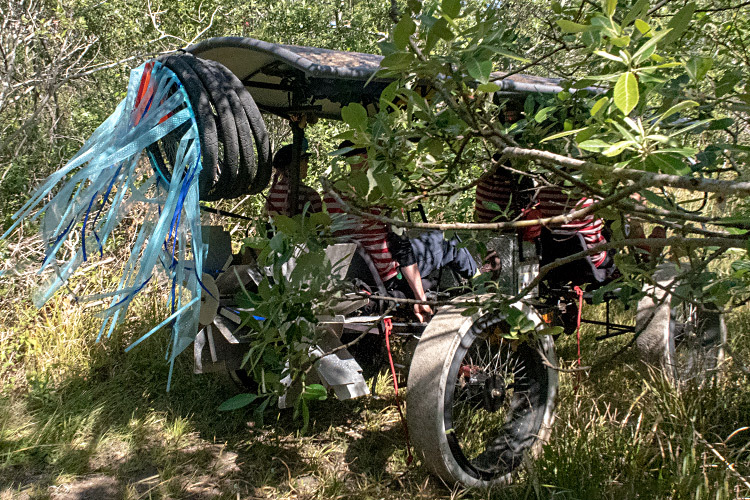 She planned a sculpture, but ended up with a bike instead. The A-Team does have a pilot somewhere in there. A-Team went on to win the One for the Little Guy Award. 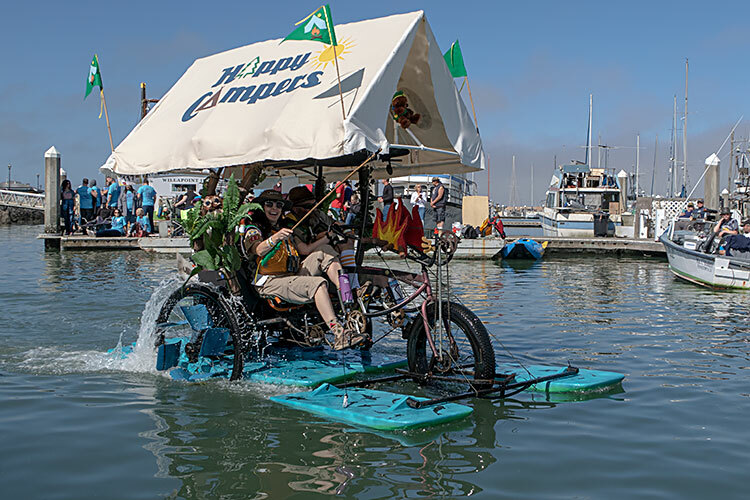 Return of the Peace Peddlers had bold inflatable pontoons and paddlewheels. 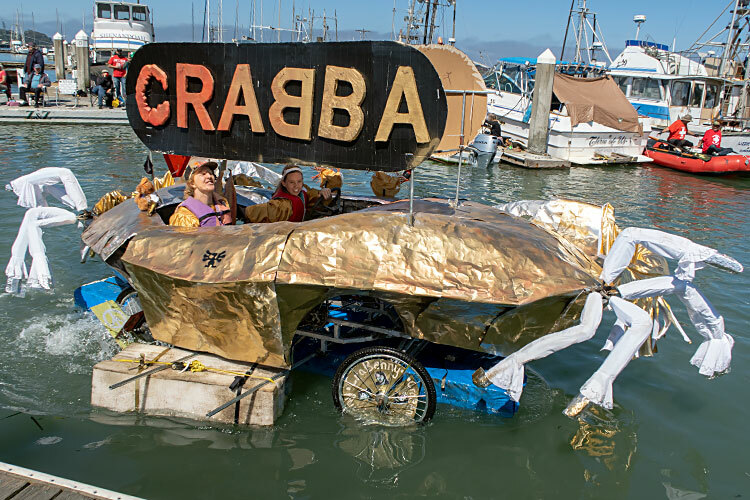 CrABBA is ABBA reunited after 35 years, metamorphosed into a singing, dancing crab with homemade wheels and disc brakes. 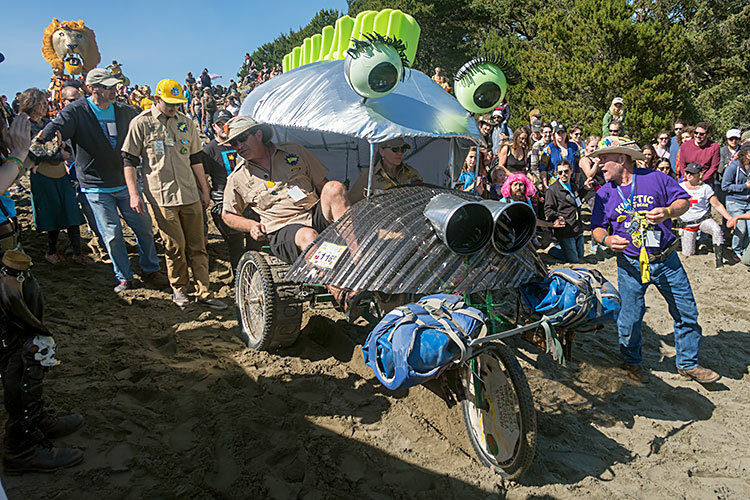 CrABBA went on to win the Second Place Art, Second Place Pageantry, Second Place Spirit of the Glorious Founder, and Racers’ Choice and tied for Best Campsite award. U.S.S. 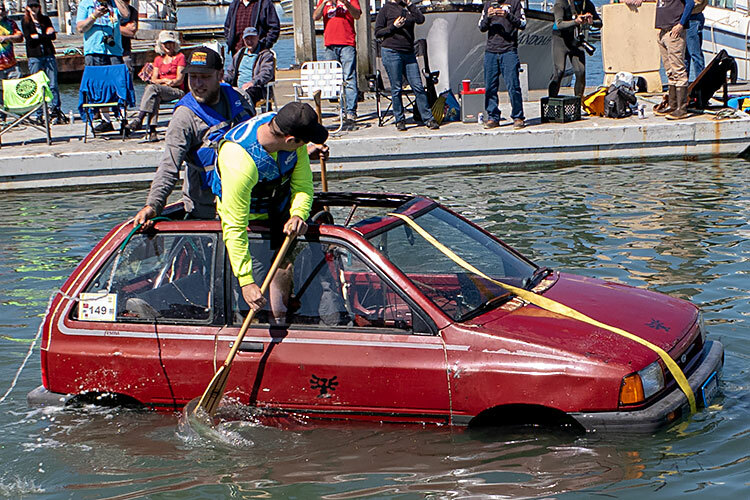 Festiva was extraordinarily unergonomic on the water as the pilots reached out with paddles. 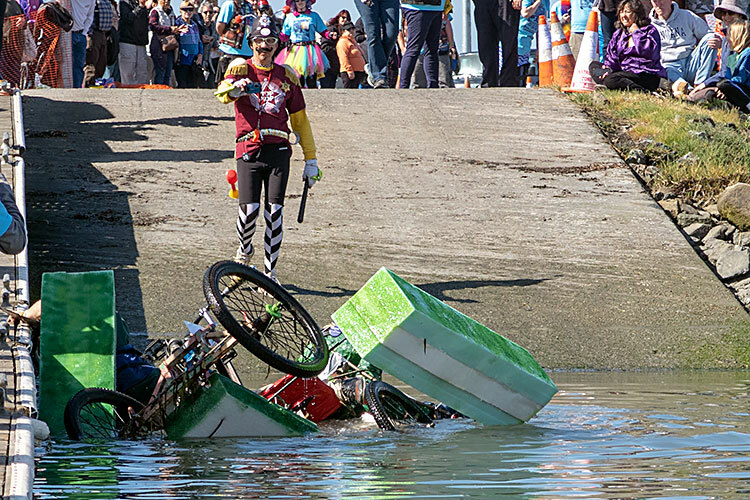 A bilge pump helped keep it from sinking. 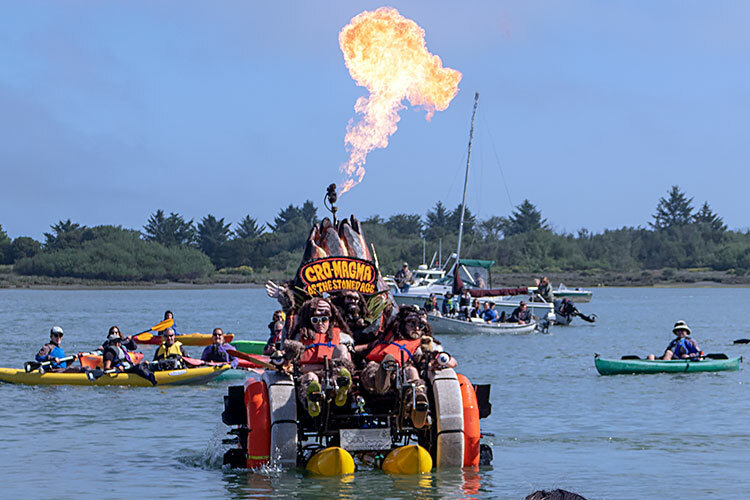 Cro-Magma of the Stoned Age dwarfed kayakers and wowed them with flames. 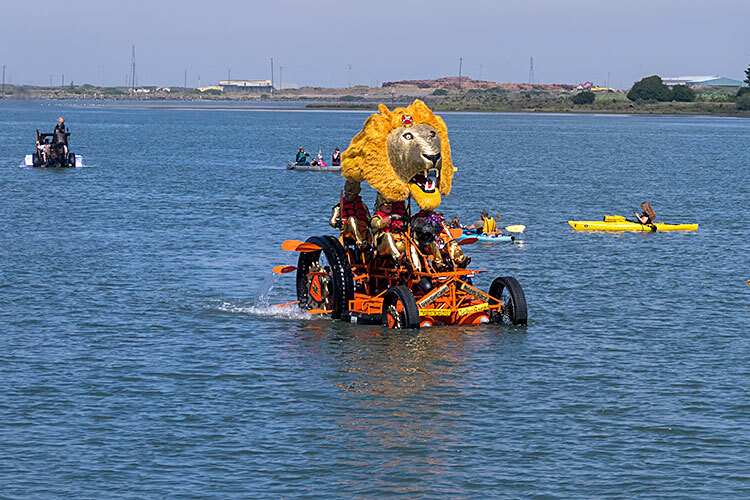 Lion Kings was elegant on the water. 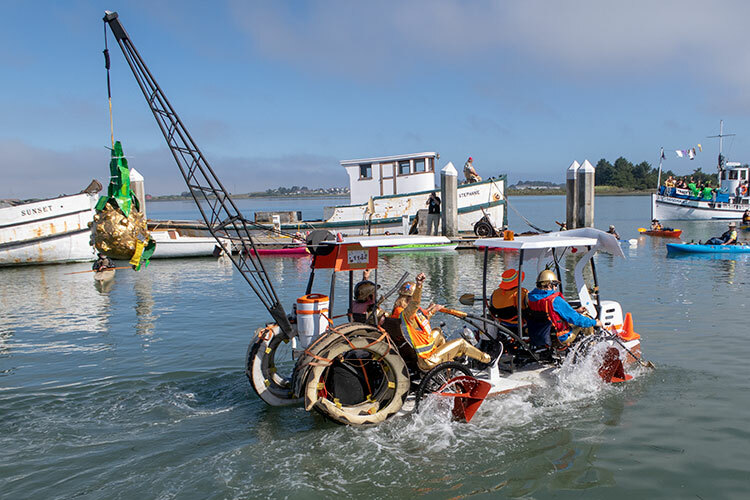 The pontoons on Herrmann’s Merry Mollusk looked a little wrinkled at the halfway water point. 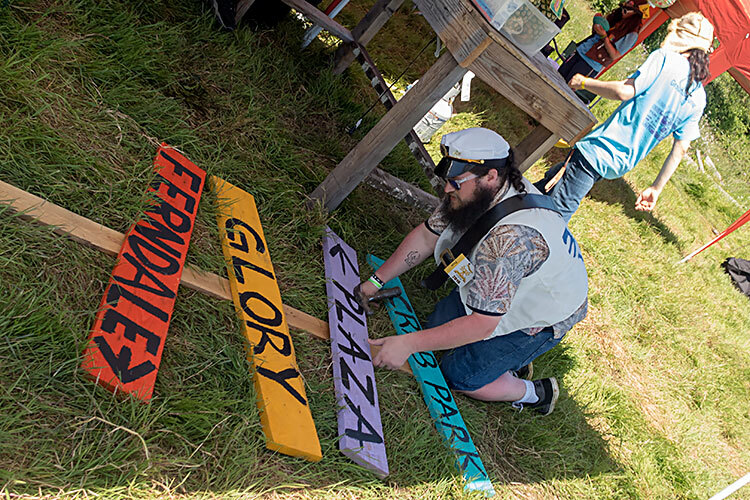 Pit crew photographed Hunka-Hunk-A Burnin' Ham: Glazed for Glory from a convenient pier. They went on to win the First Place Art award. Glory Diver on the open water. 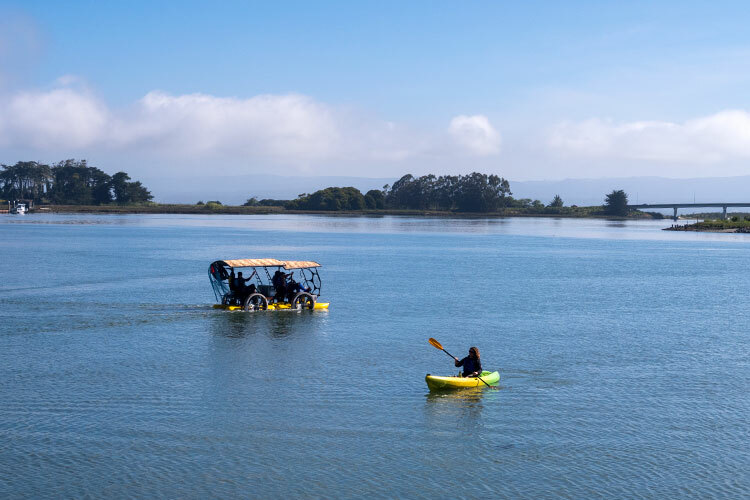 Black Tie Affair sailed up the bay. 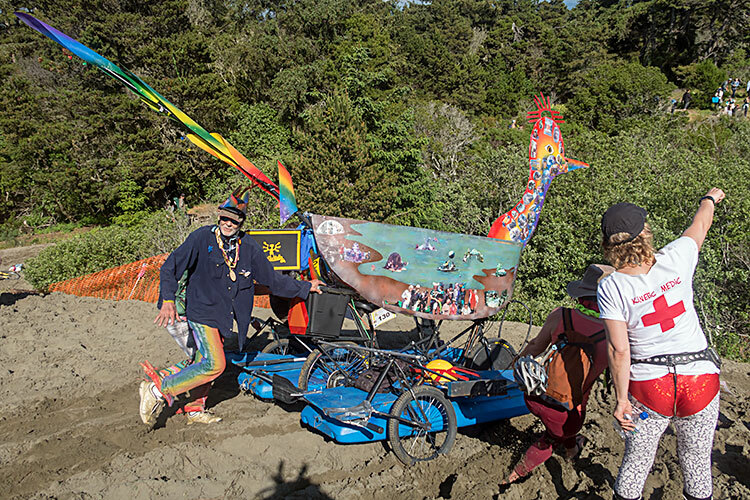 Crew arrived to assist Cro-Magma of the Stoned Age at the water exit. 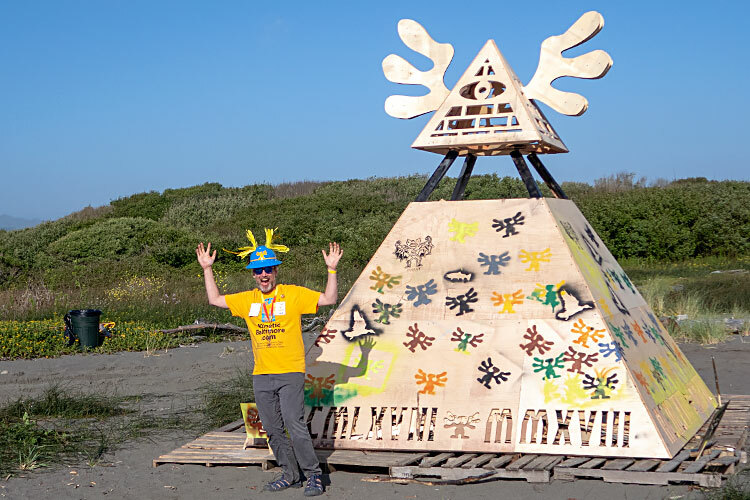 Cro-Magma tied for Best Campsite. 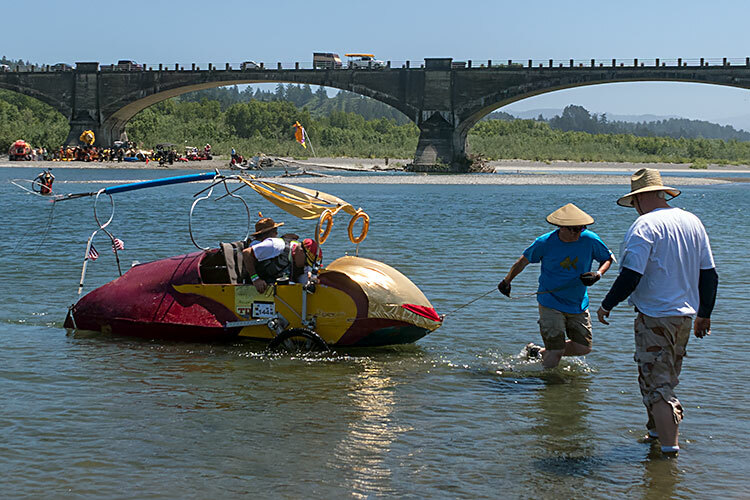 While a crowd of sculptures prepare for crossing the Eel River, Flying Spaghetti Monster and Hunka-Hunk-A Burnin' Ham set forth while spectators line the CA-211 bridge. Built in 1911, it’s still the longest functional poured concrete bridge in operation anywhere. 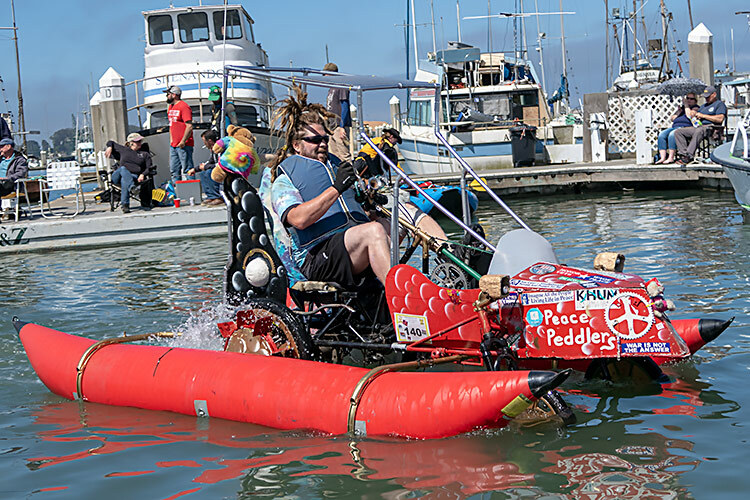 Flying Spaghetti Monster would later receive Second Place Speed. 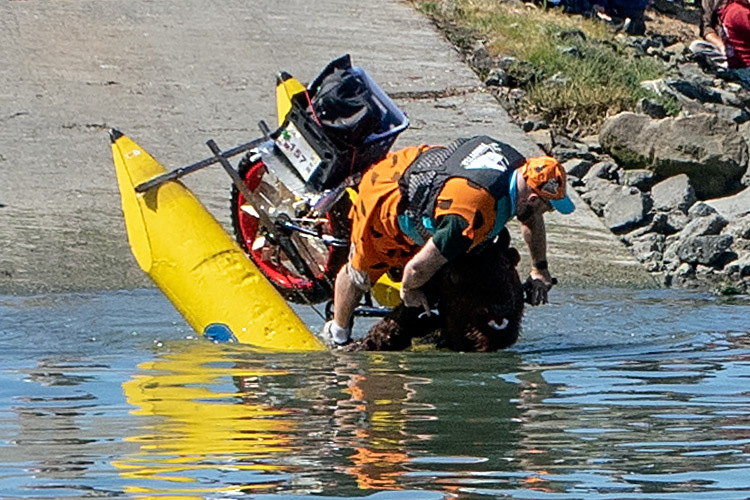 With Yellow Brick Rode close behind, Hans towed Speed Racer through and out of the water. Not surprisingly, he won Golden Flipper (Water). 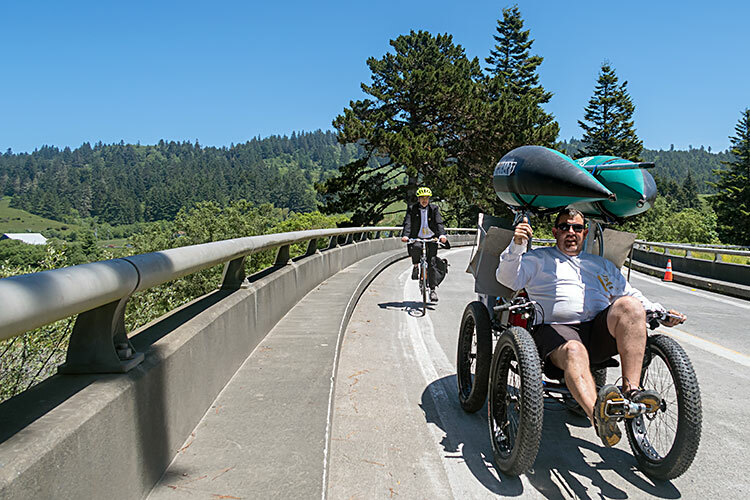 #discodarren celebrated completing the final water crossing. 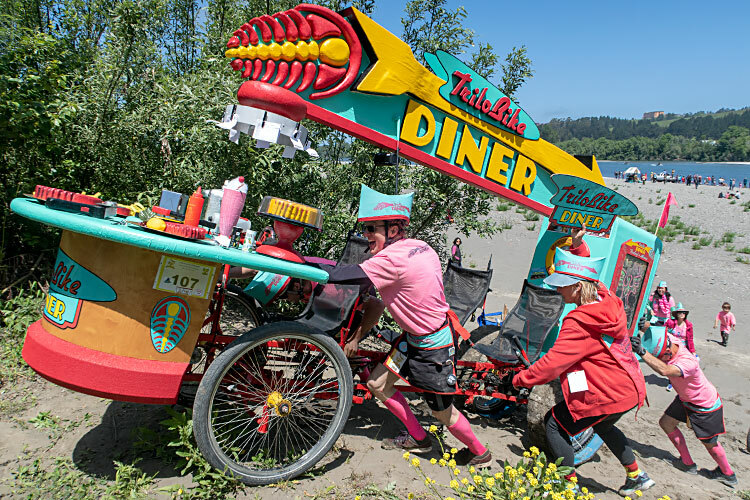 Trilo Bike Diner readily drove out of the river. 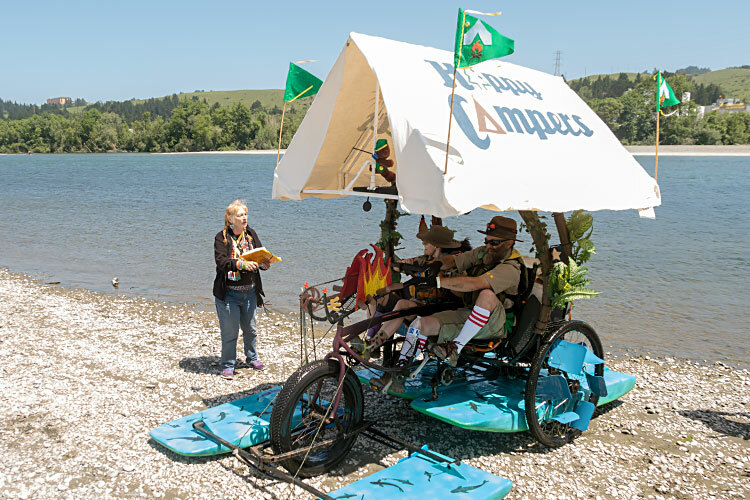 Happy Campers was subject to the scrutiny of the site judge. Sparky the Rescue Dog has ACEd 3 times. 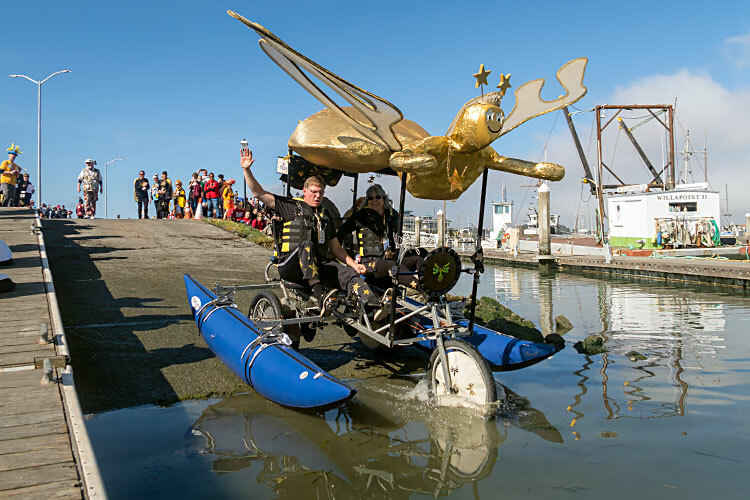 Bounce For Glory used long oars on the water, with the pilot facing backwards. Yellow Brick Rode threw a line to the Good Witch of the East and Wicked Witch of the West. With the shape of a goldfish, Swallow This! 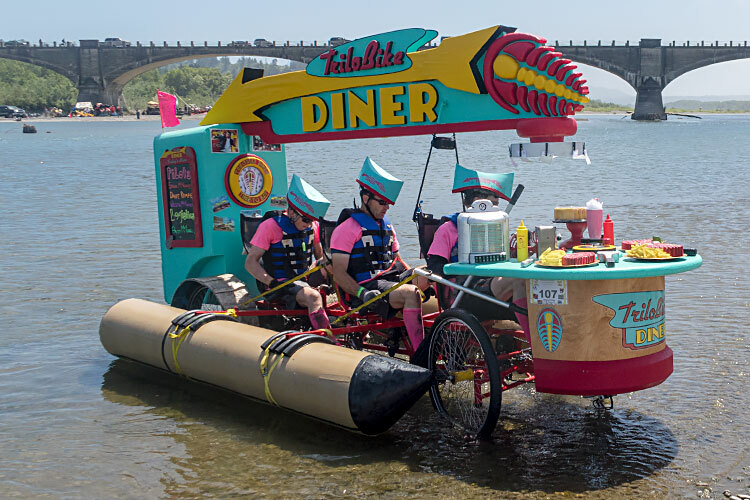 was built for the 1990 kinetic race in Boulder, and has been racing ever since. 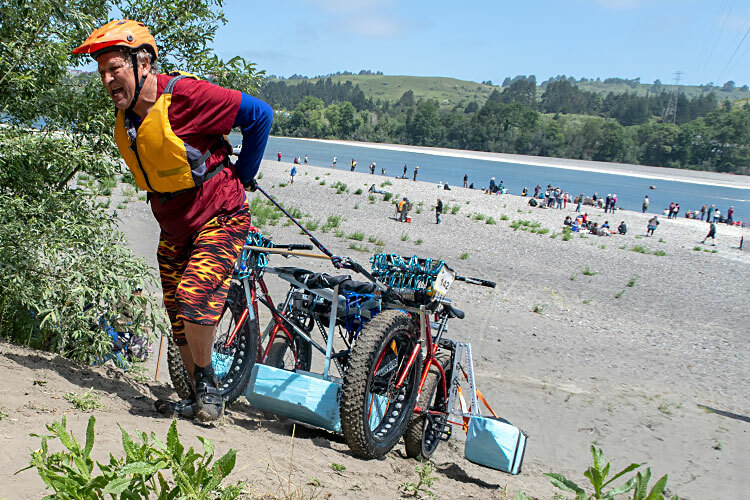 Mad Plants—Beyond Thunderclone was very effective in the shallows of the Eel River, smoothly transitioning between traction and paddle power. They went on to win Mediocre Award (which in California isn’t the grand champion). 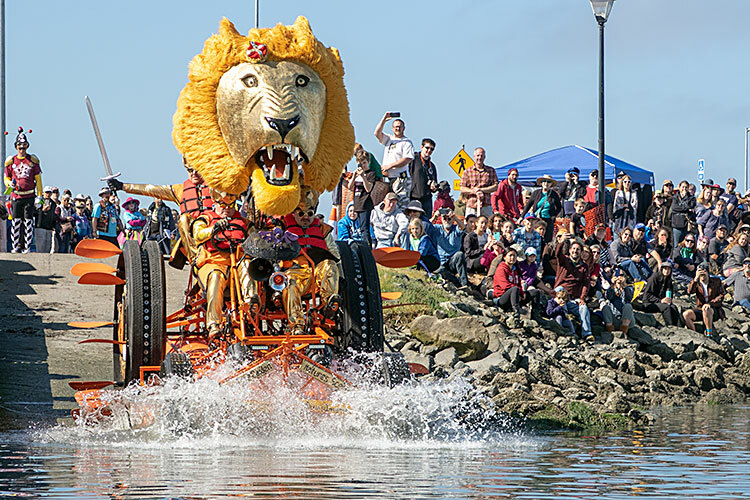 Lion Kings had a very easy time exiting the water. At the end of the day, Lion Kings won First Place Pageantry, Third Place Art, and Best Bribe. 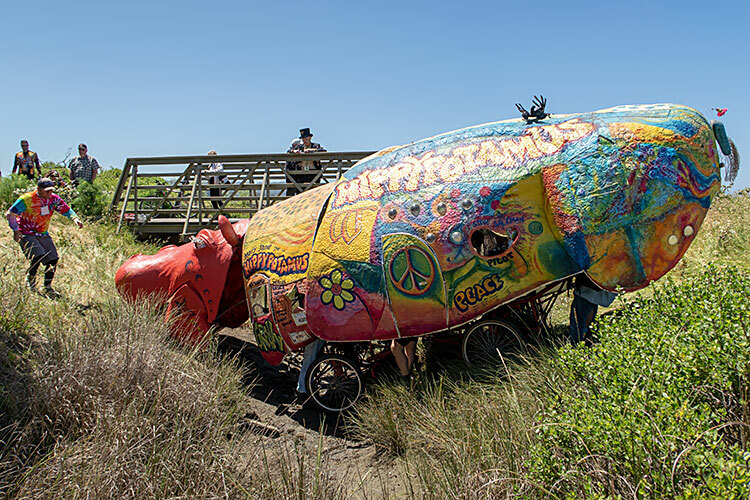 The Hippypotamus head swung open for pilot egress. 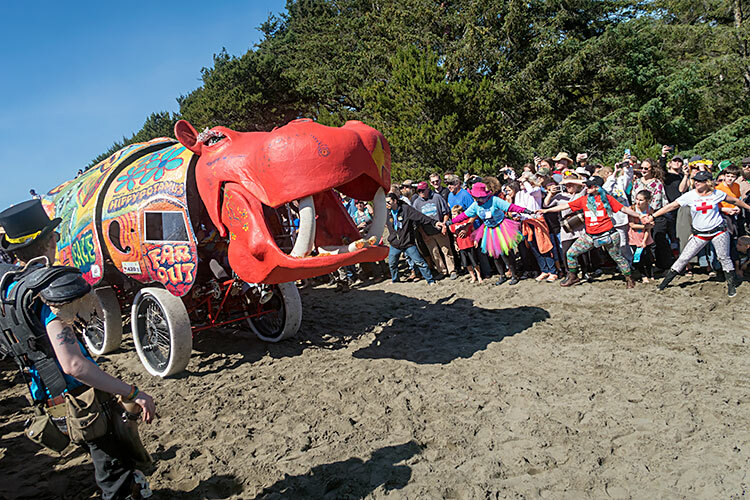 Unsurprisingly for such a large dramatic sculpture, Hippypotamus won Spectators’ Favorite. 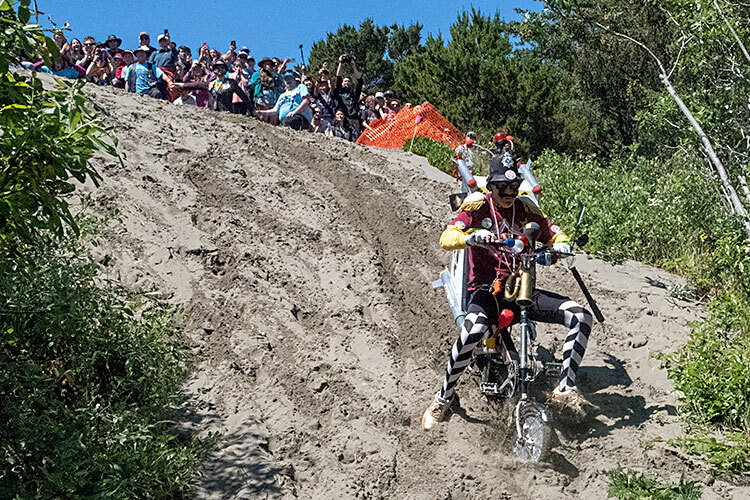 One pilot hauled Bikin’ Fools Angels up the slope. Bikin’ Fools Angels went on to win the 6:32 Award for being the first team to lose their ACE for coming in after the first day’s deadline. 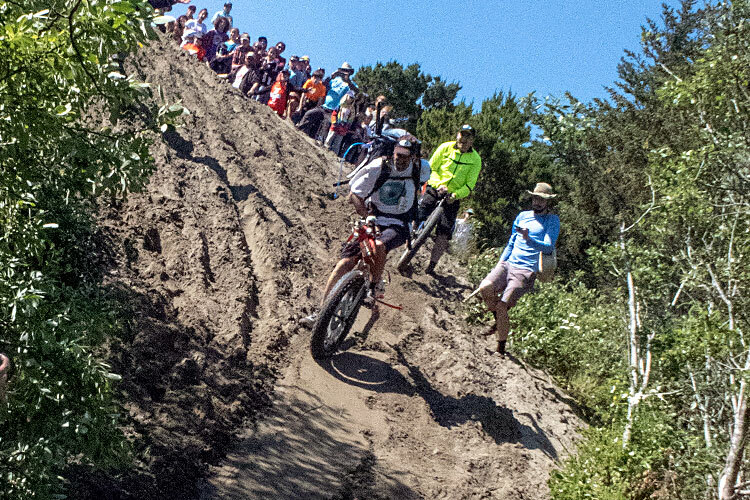 Five pilots hauled Trilo Bike Diner up the slope. 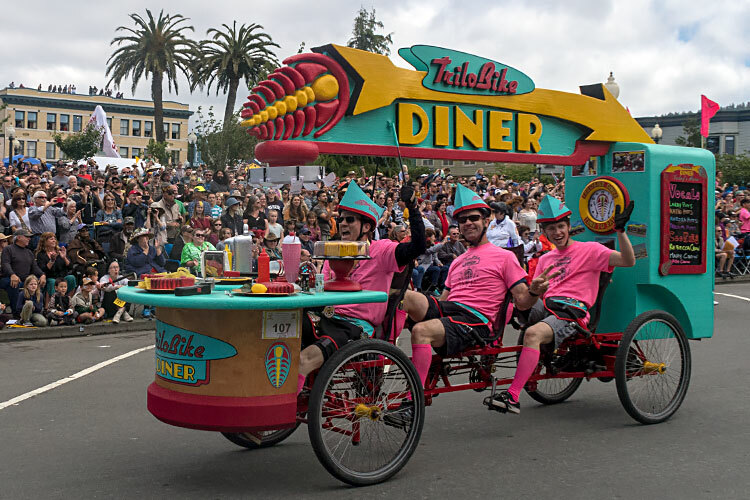 A few hours later, Trilo Bike Diner was awarded 2018 Kinetic Grand Champions. 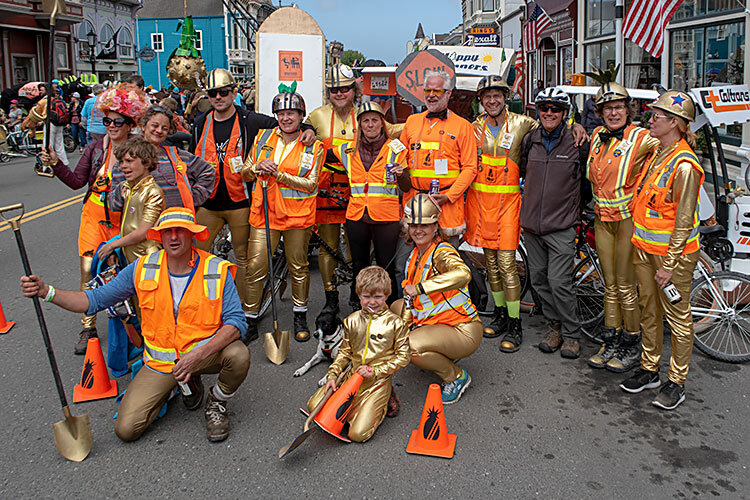 Seven teammates hauled Caltrans Solid Gold Pineapple Wrecking Crew up the slope. 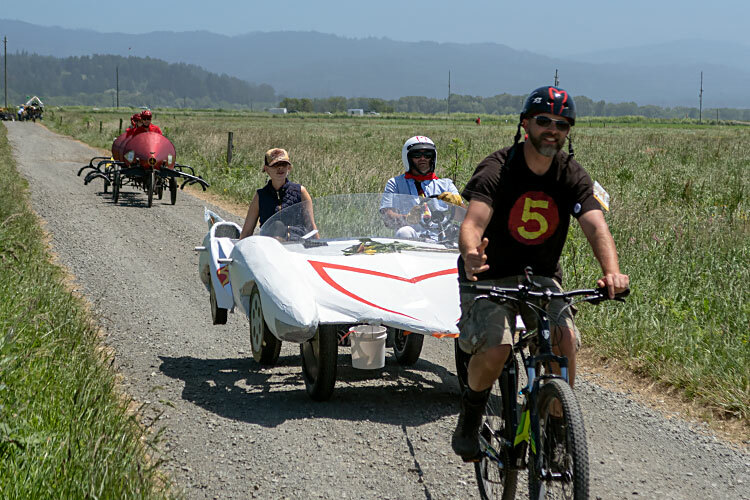 Hans continued towing Speed Racer on the farm roads into Ferndale, with Melvin and Happy Campers behind. 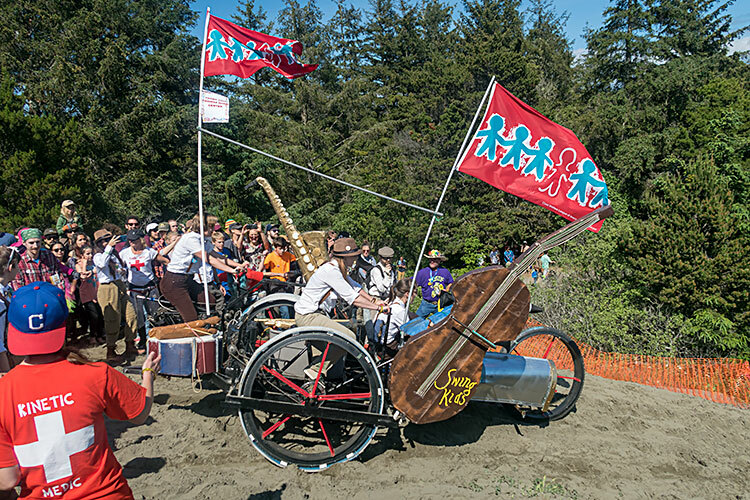 Happy Campers was on its way to receiving Third Place Engineering and Port Townsend Award. 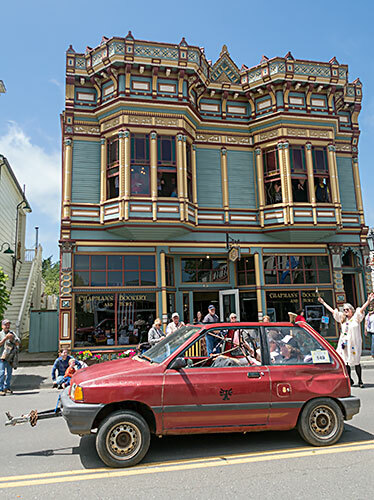 The finish line is in the heart of Ferndale (population 1,372), right outside the Hobart Brown’s gallery until his death in 2007. 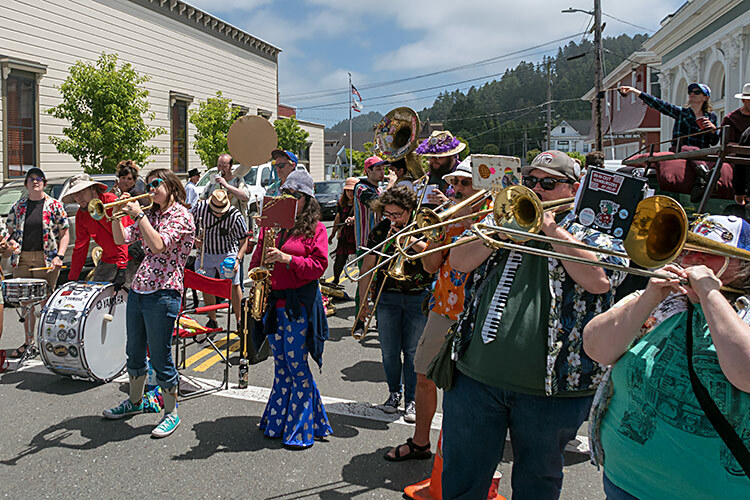 The Royal Kinetic Madness Band performed for the gathered crowd. 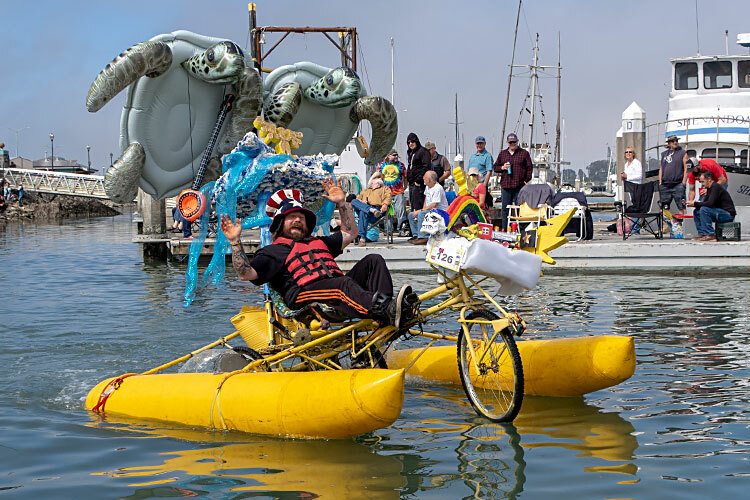 Cloud of Unknowing—Flying Squirrel did the circle of victory around Ramp Meister at the finish line, with its large pontoons still stowed up. 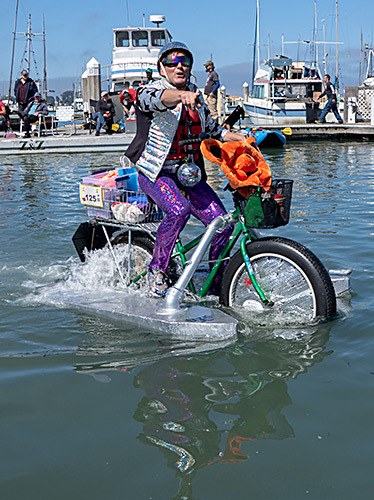 Few racers in Baltimore use inflatable pontoons; they’re slow at transitions but otherwise very efficient. They won the They Came From Out of Town Award. 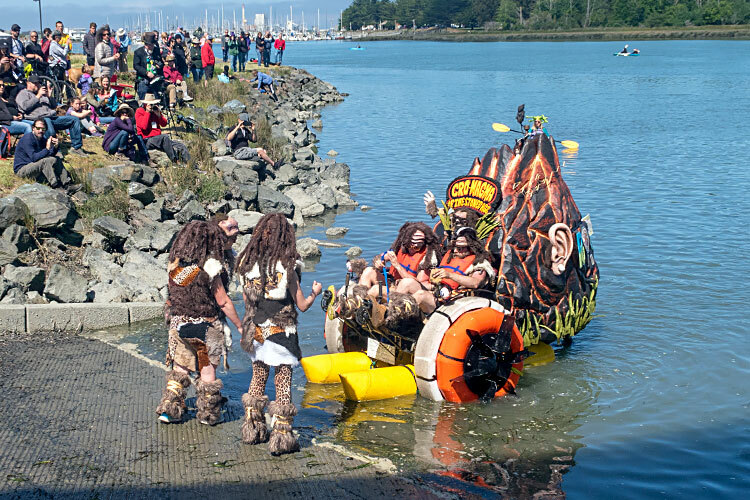 Melvin crosses the finish line, with its pontoon brackets still mounted. 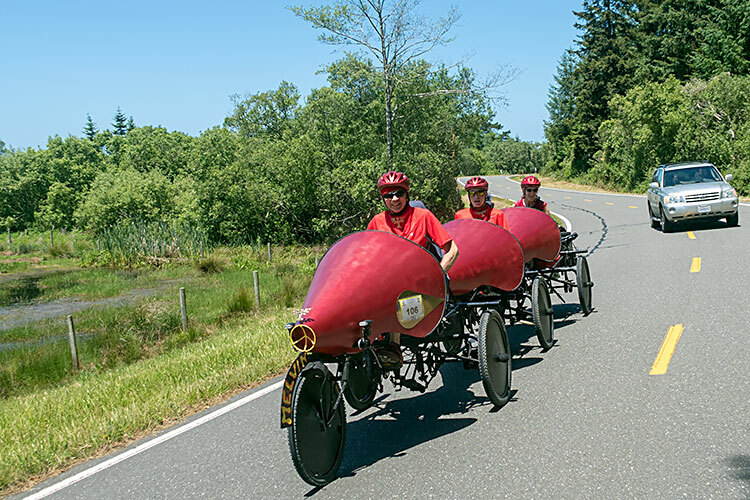 They would soon win Third Place Speed. 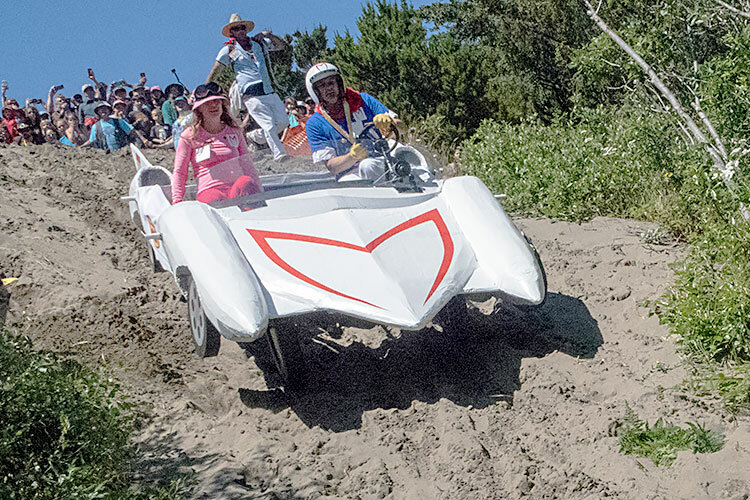 Still under tow, Speed Racer finishes. 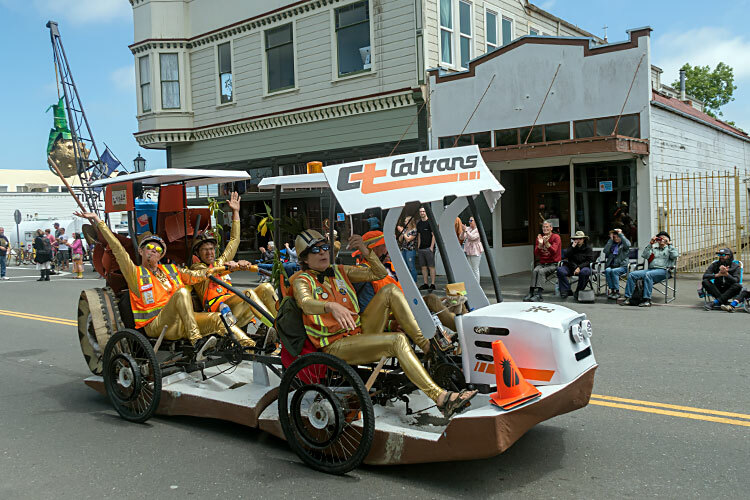 Caltrans Solid Gold Pineapple Wrecking Crew about to finish. Lobster Roll also did a triumphant circle. They went on to win Goldest of the Gold. Cyclops and U.S.S. 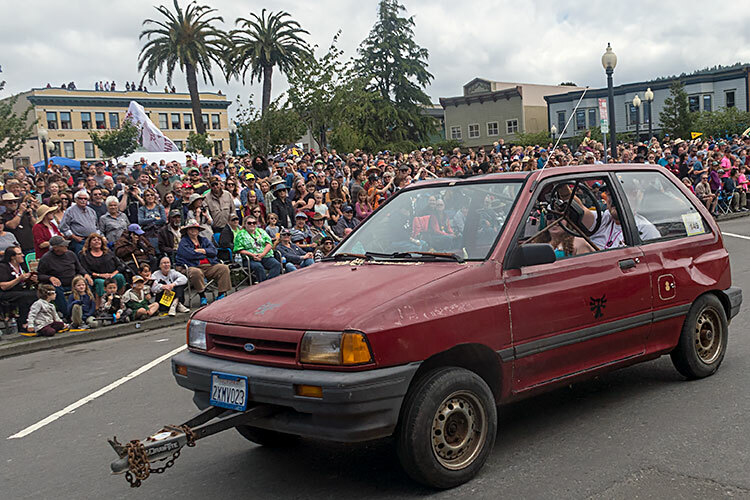 Festiva at the finish. Cyclops won the Never Give Up Award. Gears and steering inside U.S.S. 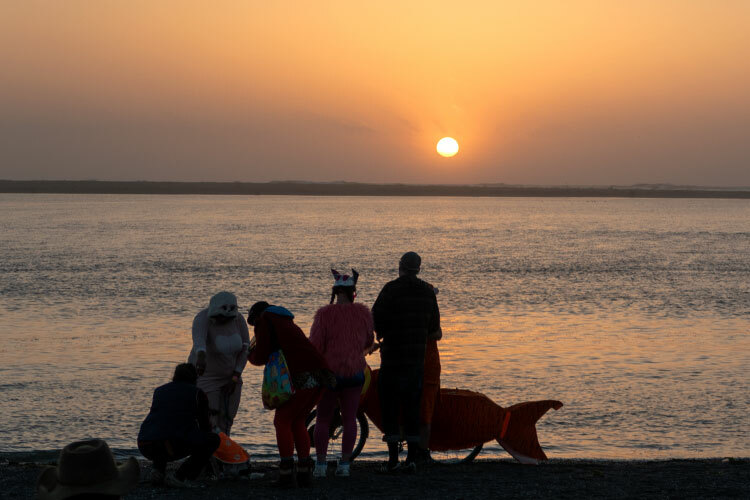 Festiva. 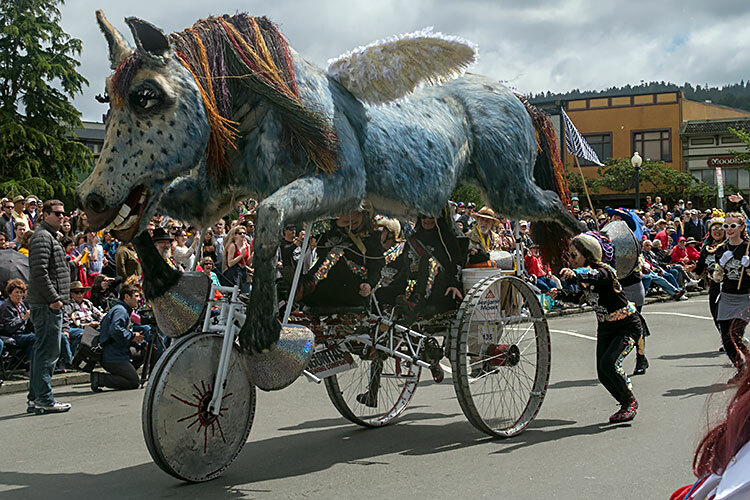 They won Second-to-Last Award and Third Place Spirit of the Glorious Founder for building something so unmanageably successful. 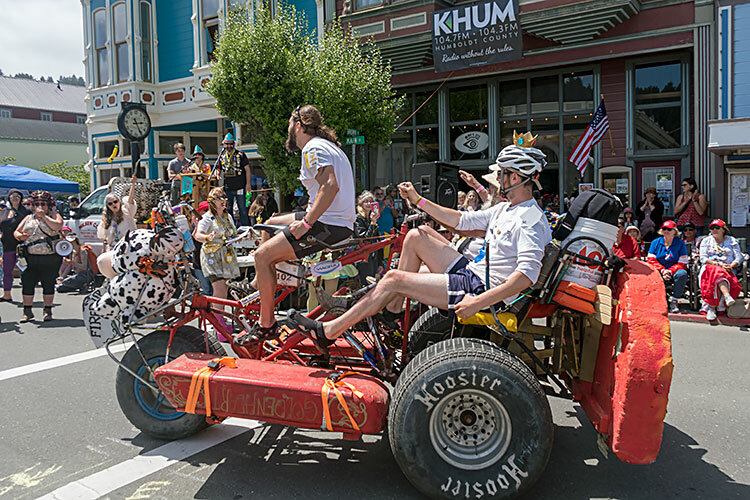 Cliff and Amy broadcast the race all weekend on KHUM FM. Swing Kids staged a dance. 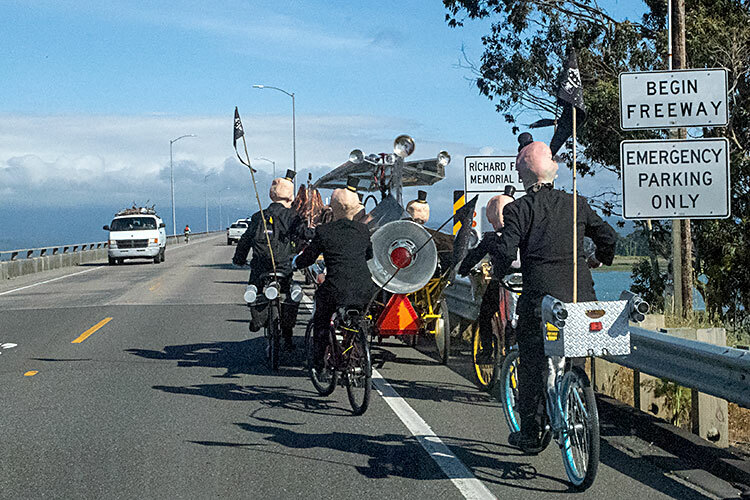 Gilded Ghost Guild aka Kinetic Paranormal Society at the end. Black Tie Affair did a tight loop turn in front of the bank. 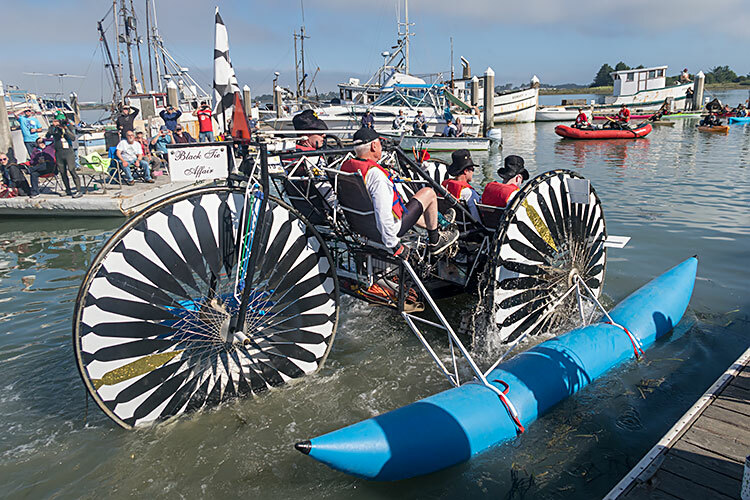 They were soon to win Second Place Engineering. 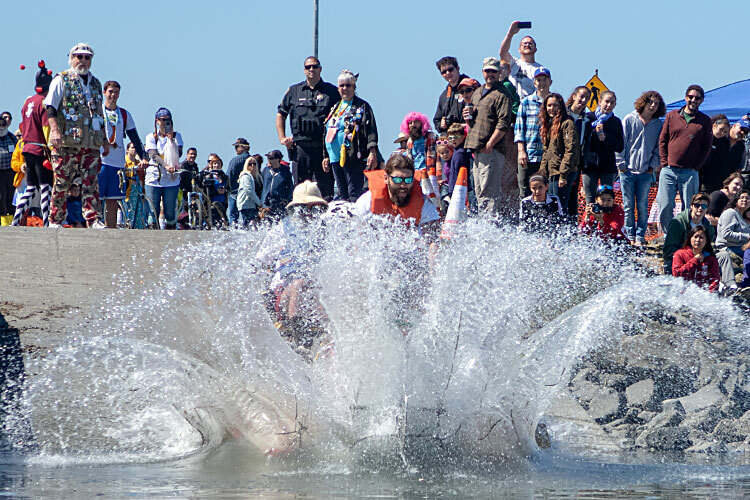 The Caltrans Solid Gold Pineapple Wrecking Crew team won First Place Engineering and Biggest Splash. 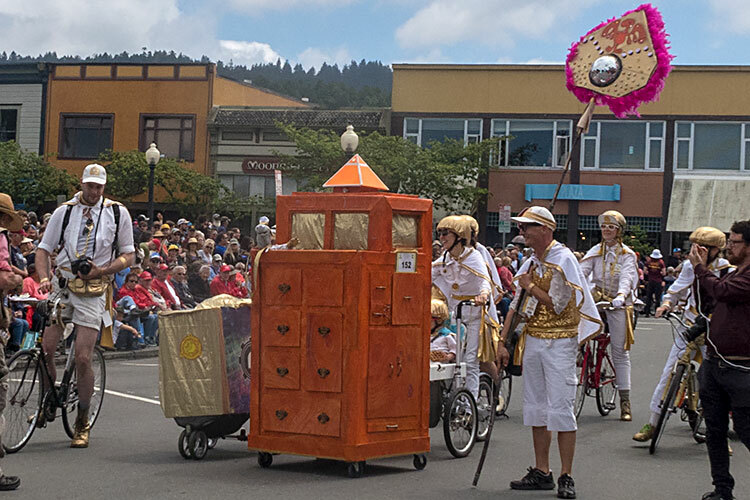 Kinetic Encounters of the Fiftieth Kind won Third Place Pageantry. Tom and Johanna Jones with Rampmaster at the finish. 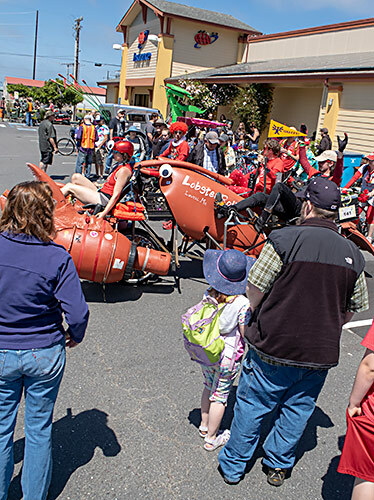 Friday night before the race the Kinetic Thrills Pageant where teams assembled in costume for stage performances. 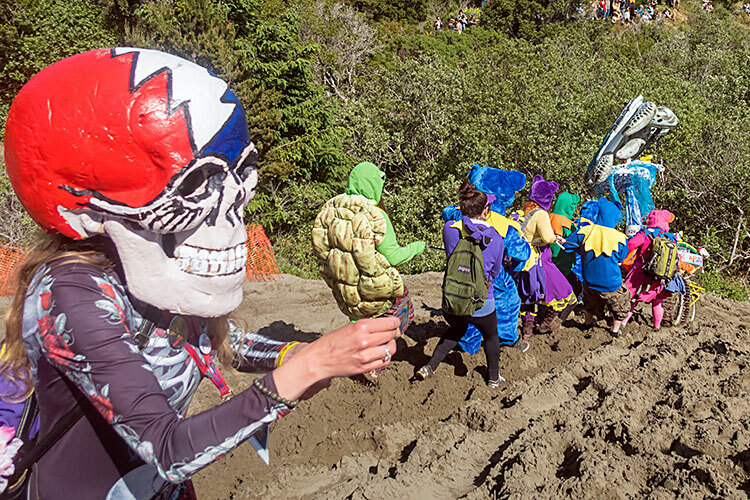 Here was Team Terrapin’s Let My Inspiration Flow. 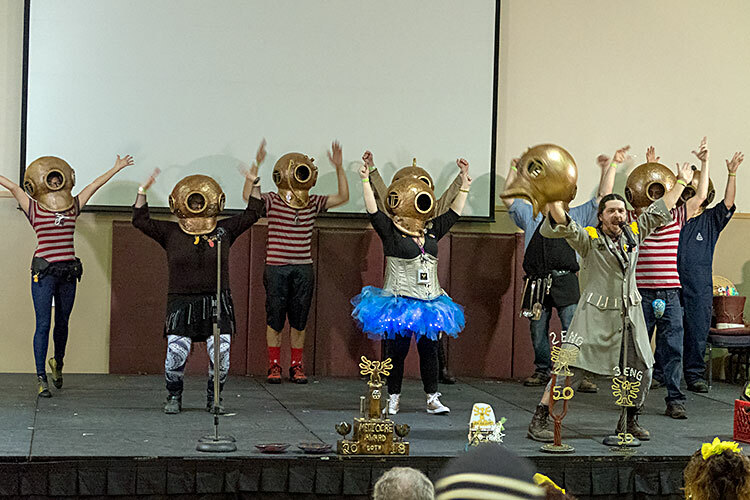 Team Tempus Fugitives’ Glory Diver had awesome helmets at the pageant, but they didn’t wear them in the race. The pageant also includes official team photos, including Team Goddess Star Power. 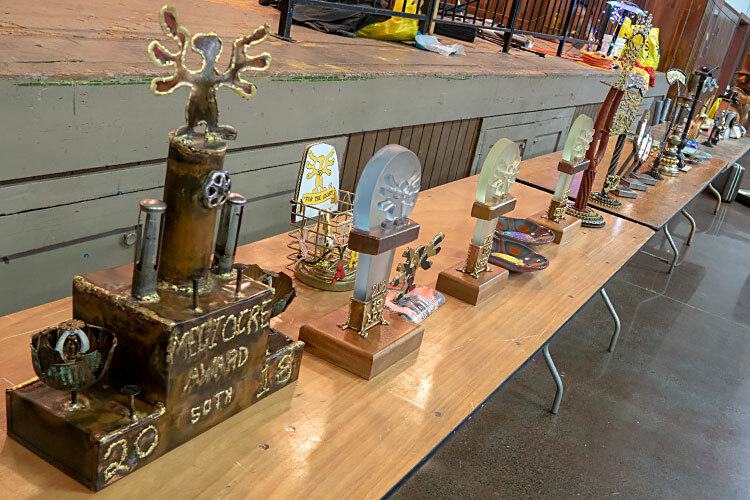 On Monday afternoon, trophies were assembled at the awards ceremony in Ferndale. The Grand Mediocre award was a giant copper trophy. 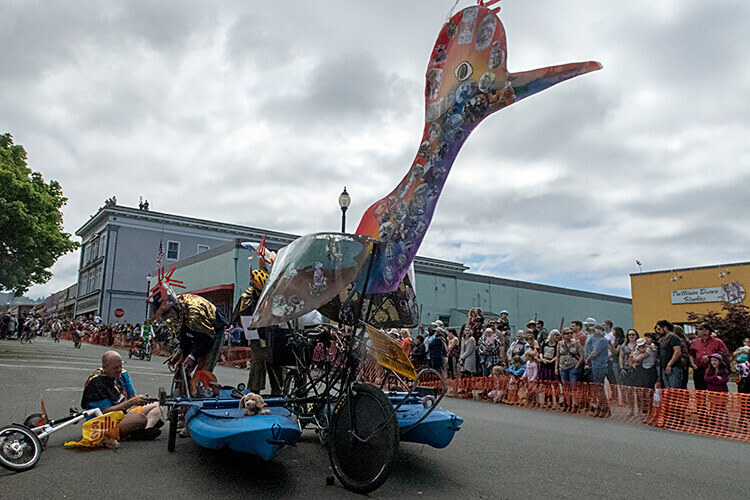 First place Art, Speed, and Engineering were cast glass with embossed kinetic chickens. 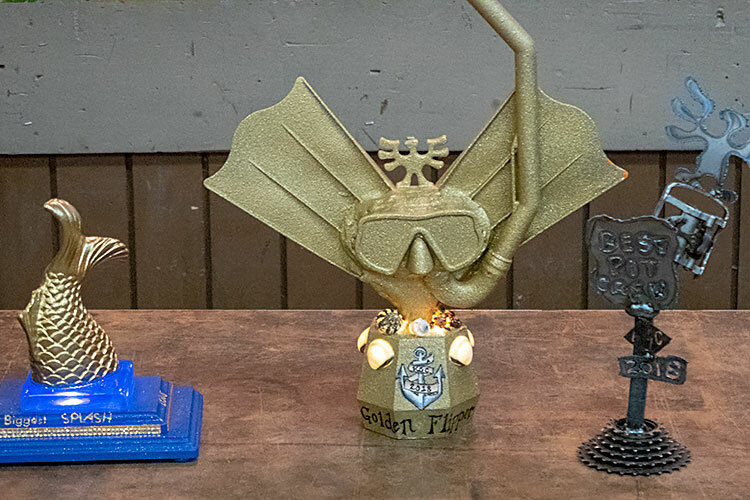 These were the Biggest Splash, Golden Flipper, and Best Pit Crew trophies. Unfortunately, Tom and Johanna had to leave for a 6-hour drive to the airport and couldn’t stay for the ceremony. 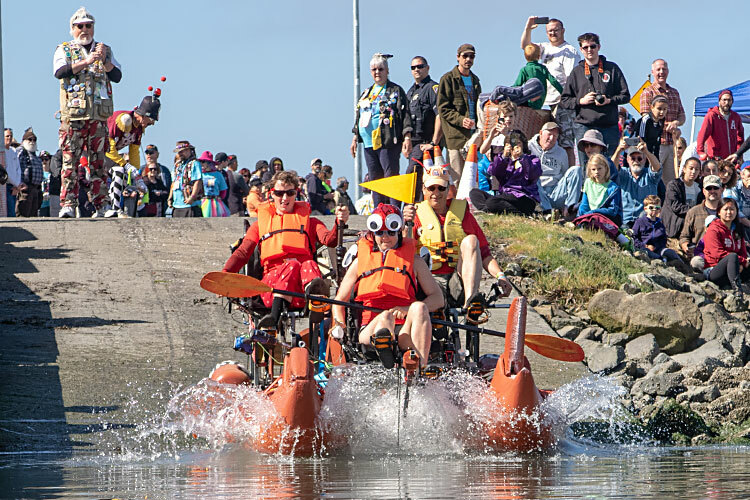 If you’d like an email when we publish coverage of new races, join our New Race Coverage Mailing List!